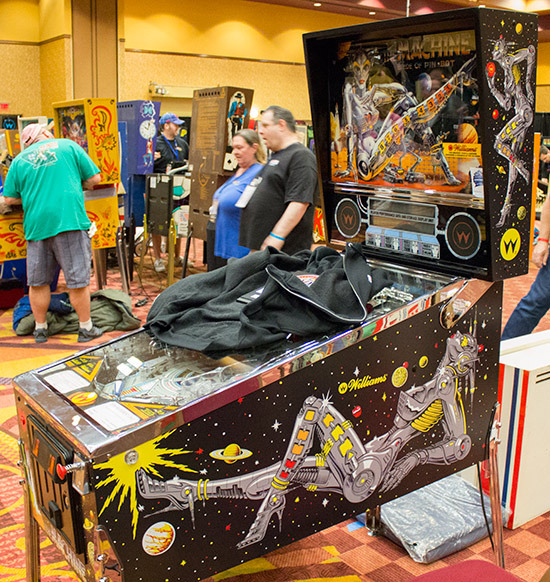 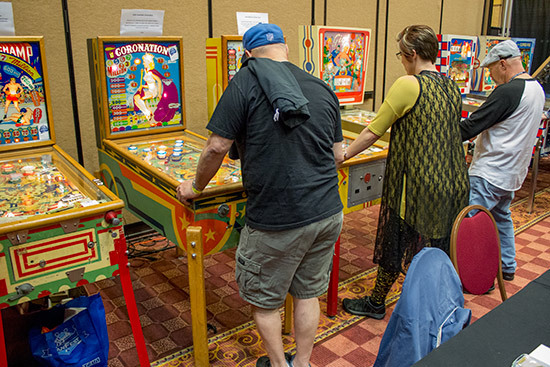 Welcome to the start of our coverage of the Texas Pinball Festival 2017. 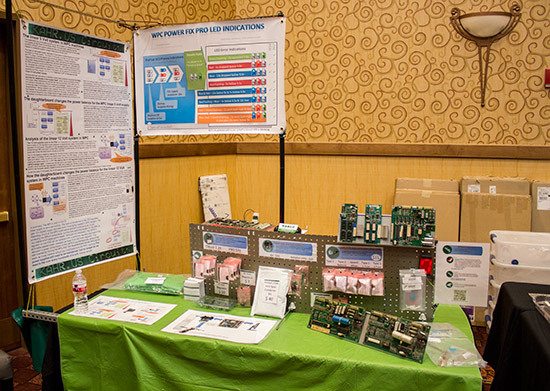 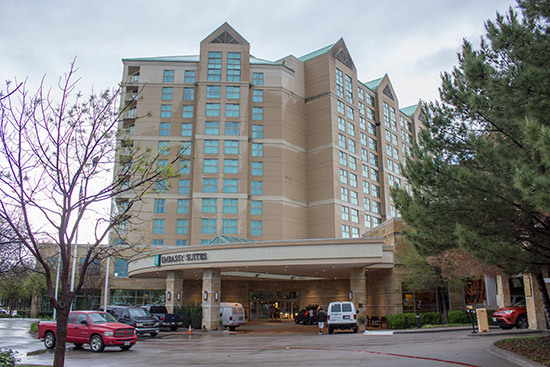 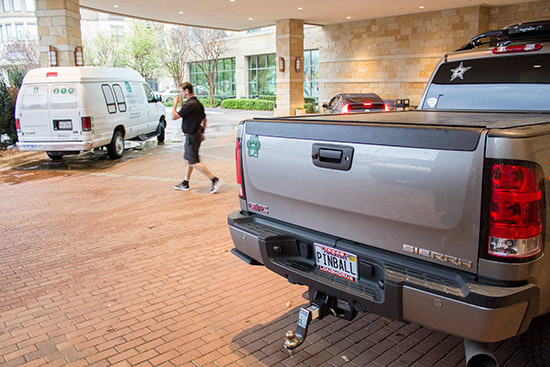 We have been regular attendees to the TPF for many years, and we are back in the familiar surroundings of the Embassy Suites hotel in Frisco, Texas. 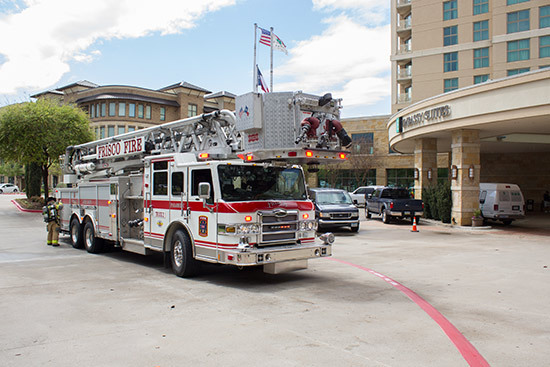 The weather here is usually pretty nice in March, but this year the weather on Friday turned to dark clouds and scattered showers amidst the sunny intervals. 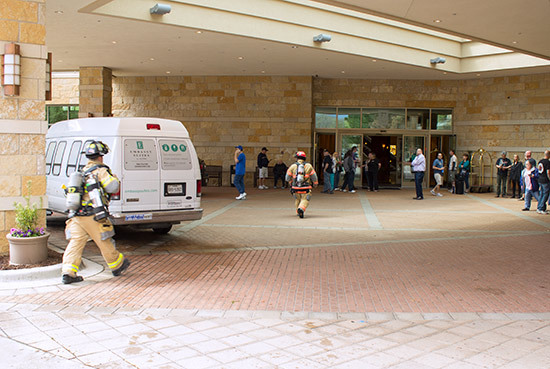 Fortunately, the rain had cleared before a false fire alarm forced hotel guests outside while the fire marshall checked it was safe to return. 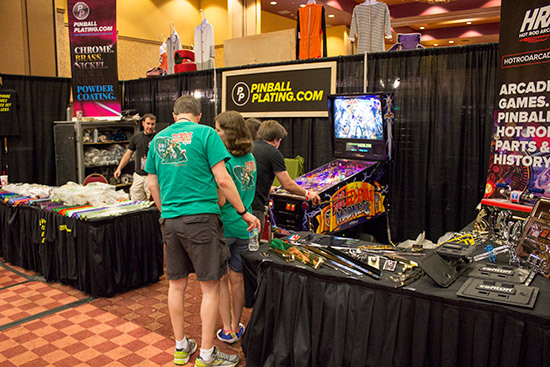 The show opened at 5pm, but before that we got a behind-the-scenes look at the games and the people setting up. 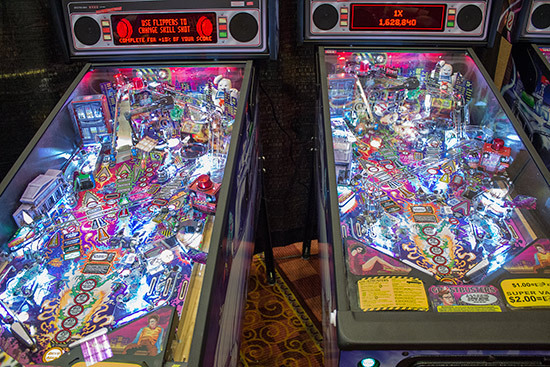 Ultra-Violet light is often seen as detrimental to pinball artwork, but two games at the TPF are using UV to highlight playfield artwork and models. 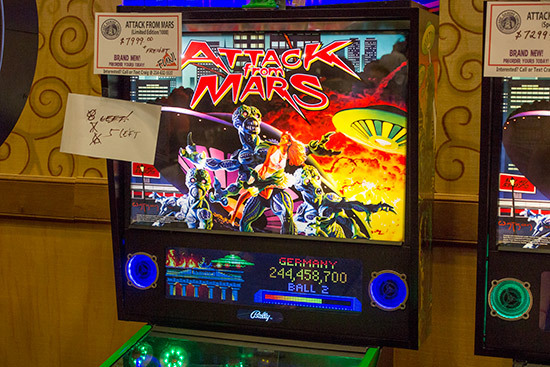 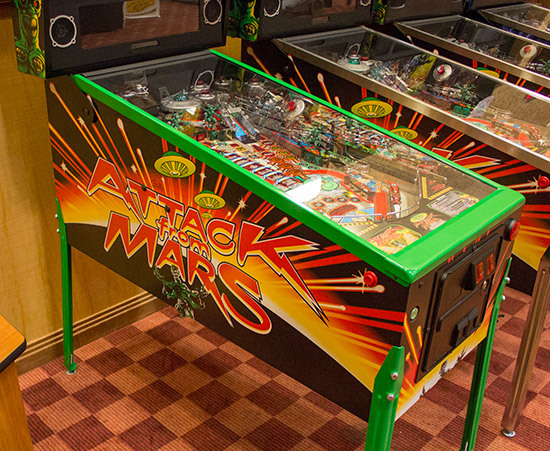 And Attack from Mars is well represented on Chicago Gaming Company's stand where three remake models are on display - one LE, one SE and one standard. 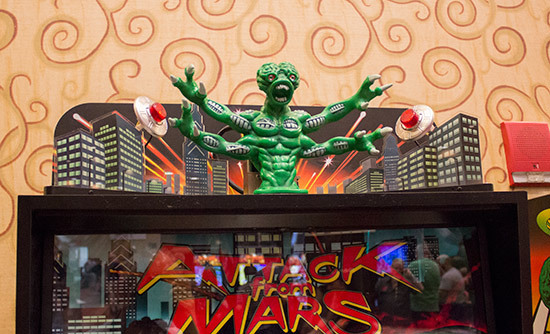 They sit alongside a Medieval Madness remake. 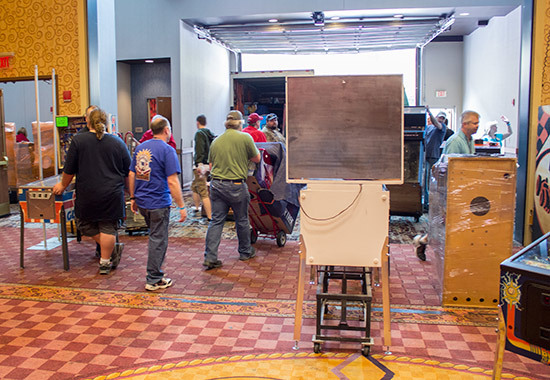 Elsewhere in the hall, machines were being set up for the start of the show. 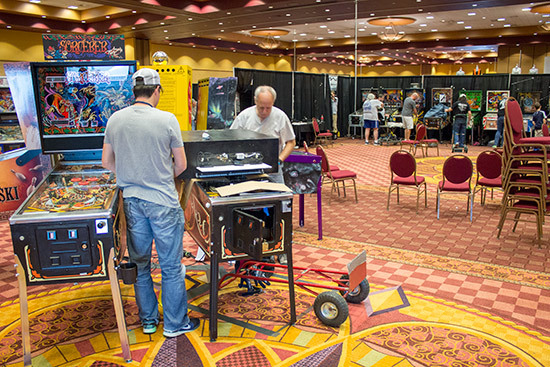 In other areas of the show hall, machines were being put together. 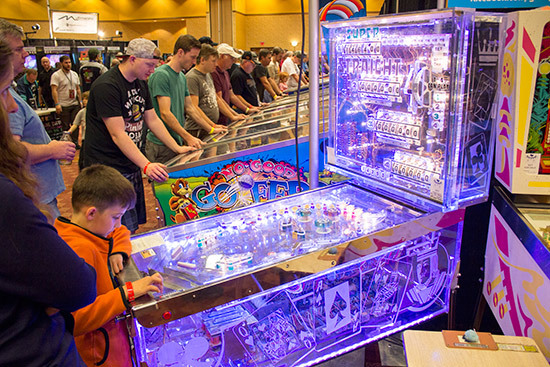 The tournaments were the first part of the show to open on Friday. 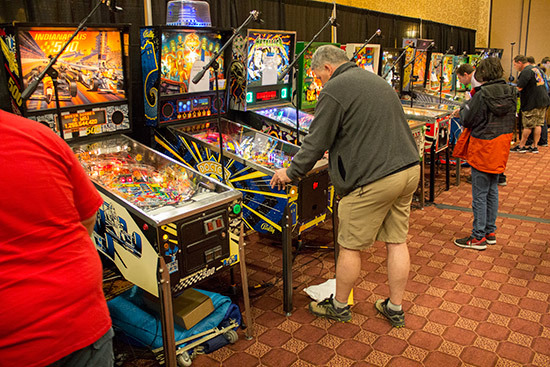 Qualifying began at 11am in the tournament area at the front of the hall. 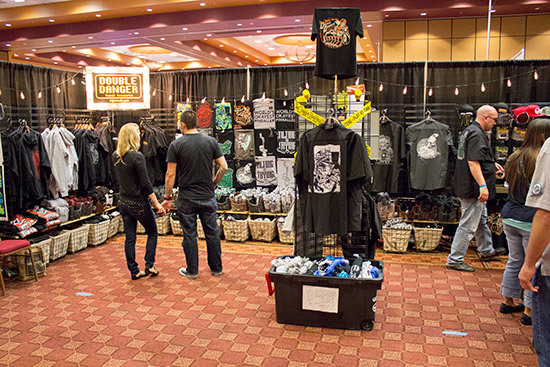 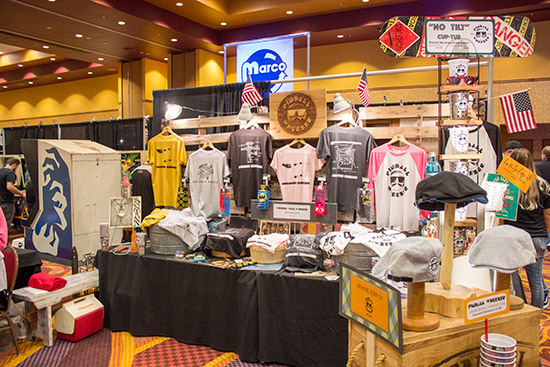 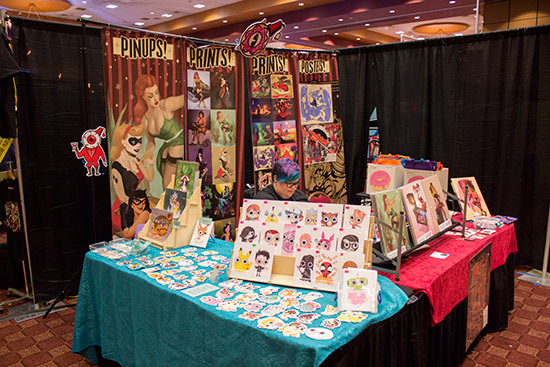 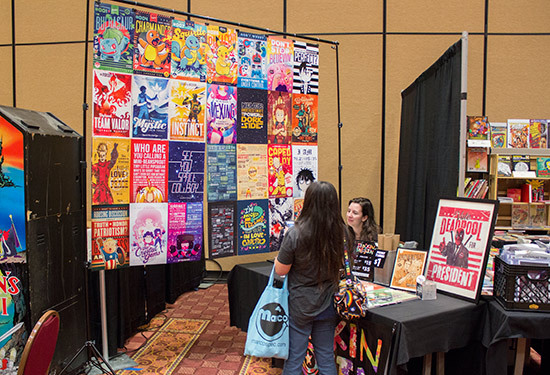 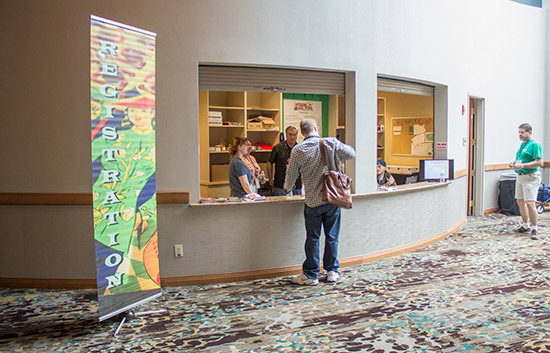 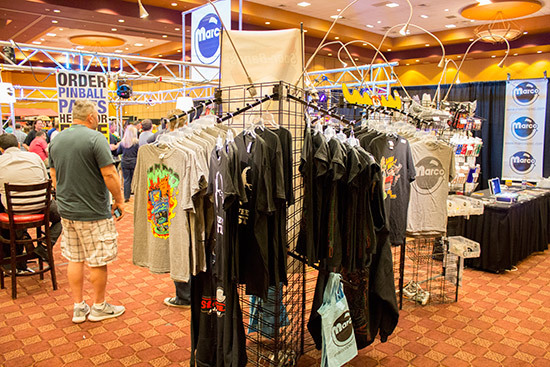 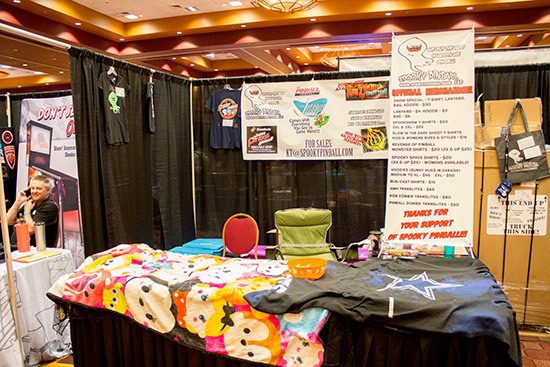 Registration for the show could be done online or in person at the ticket counter located just outside the hall. 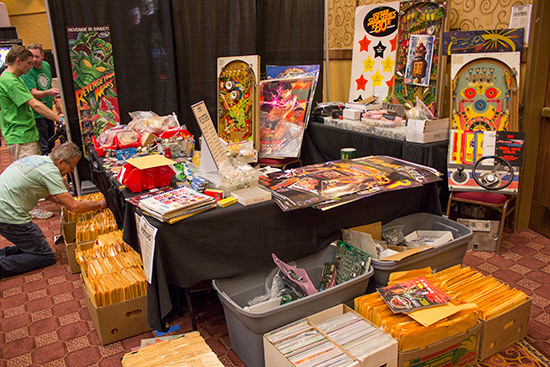 Just along from the ticket counter was Rob Anthony's room where he had his usual assortment of pinball parts and a board repair service. 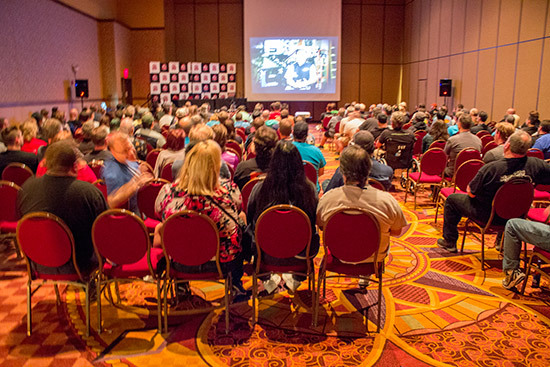 The TPF had a healthy schedule of seminars and screenings. 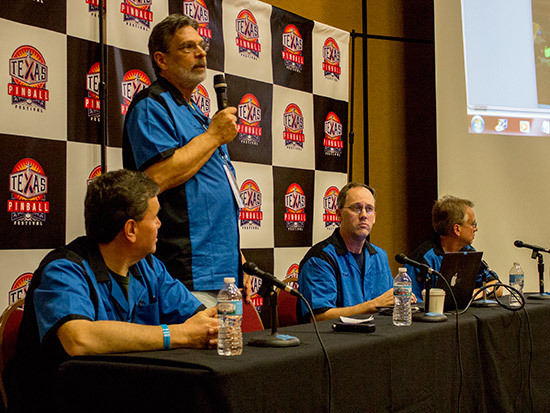 They were mostly held in the seminar room at the far end of the building from where they would be streamed and recorded. 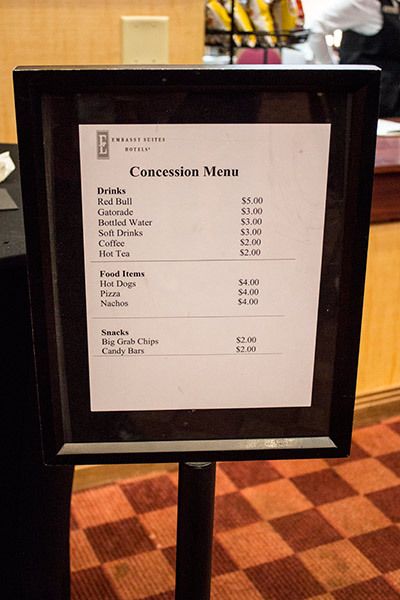 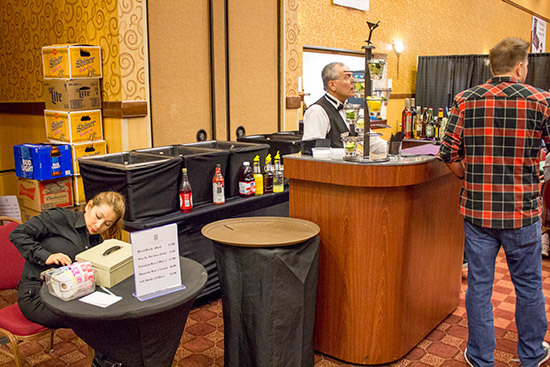 However, the very first seminar was held in the bar area at 6pm on Friday to coincide with the manager's reception which provided free drinks and snacks to hotel guests. 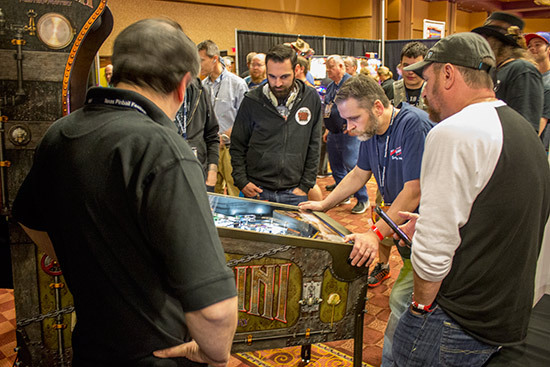 This pinball quiz was run by the Editor of Pinball News, Martin Ayub and the Editor of Pinball Magazine, Jonathan Joosten. 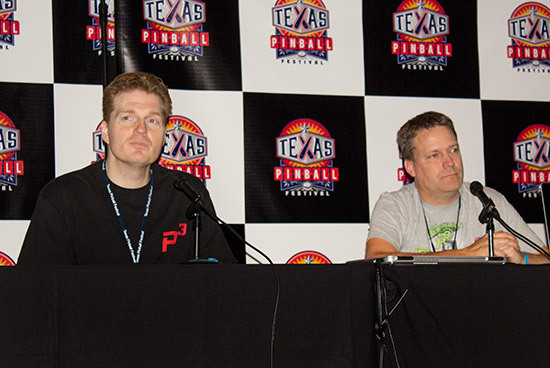 They asked guests to choose between two possible answers to pinball-related questions. 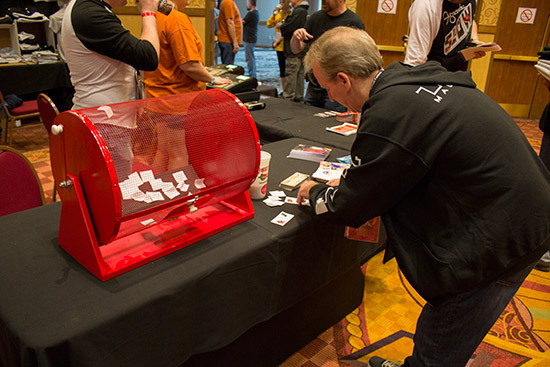 Those who picked the right answer moved on to the next round, and as soon as there were around five players left, they all drew tickets for one of the many prizes donated by sponsors. 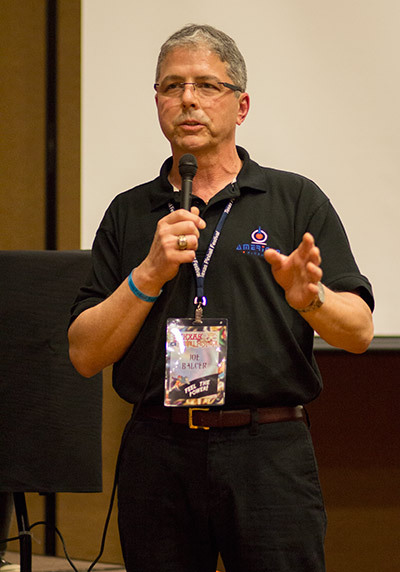 At 7pm, the seminars moved to the main seminar room with Dennis Nordman revealing just what he had been working on for the past couple of years. 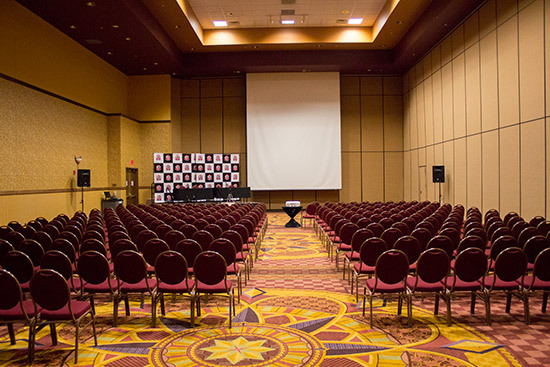 All the presentations in the seminar room were captured on a web stream. 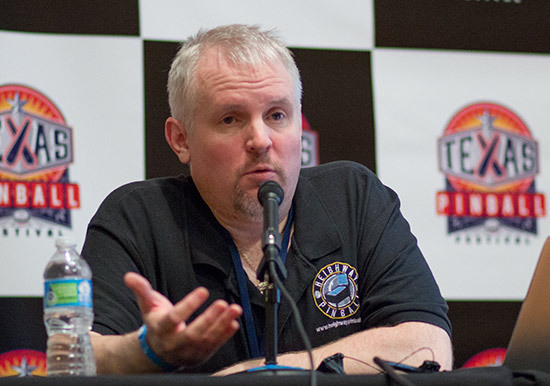 On Friday there was a problem with the internet connection which made live streaming impossible, but the stream was recorded and should appear on YouTube in due course. 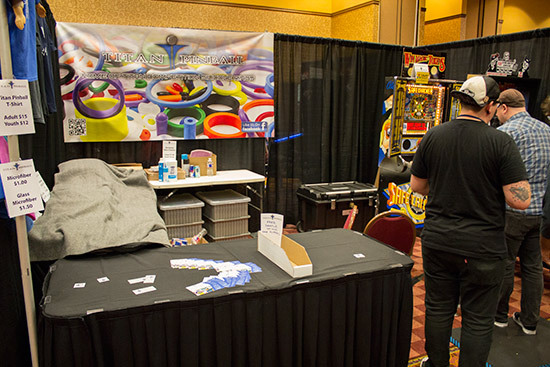 Dennis revealed the pitch and bat game he and Paul Reno developed a couple of years ago. 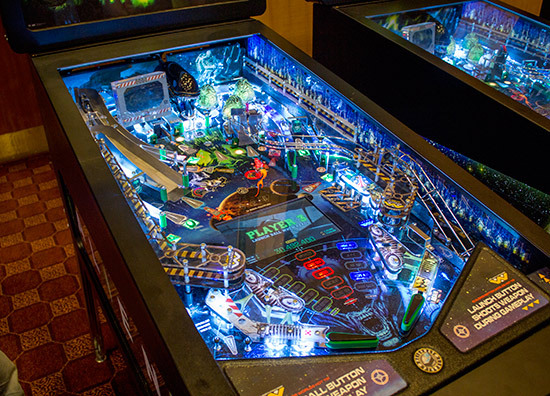 It uses an established gameplay style, but adds some new features and retains some pinball-like elements to the design. 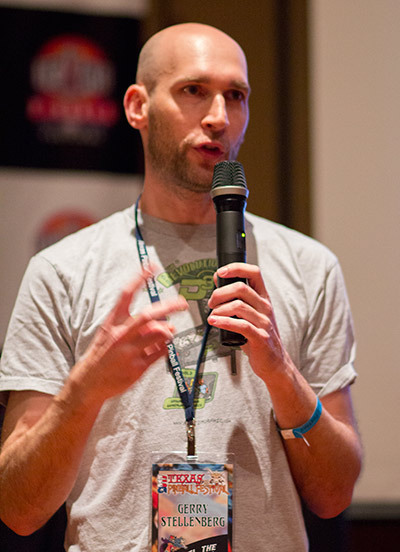 He also introduced the team who had worked on the game and a second 'zombiefied' version with different artwork and sound calls. 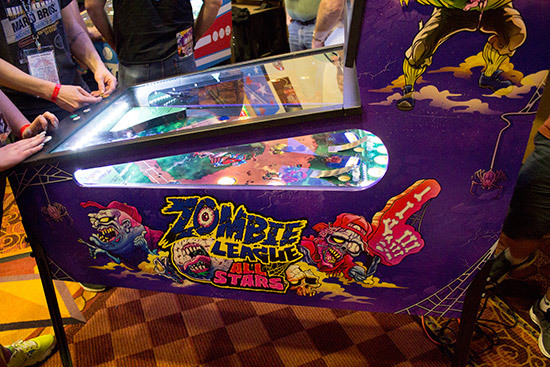 The team then unveiled the game, and the second variant with the zombie theme. 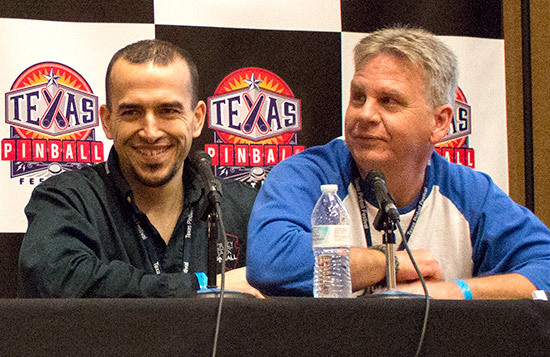 Then came the seminar with the team from American Pinball. 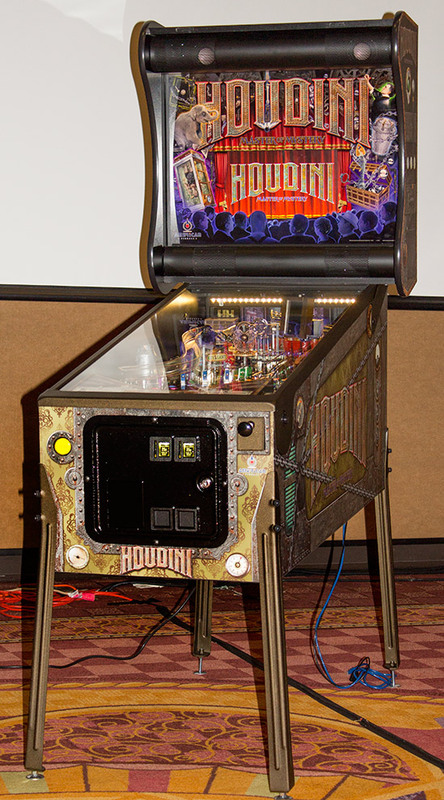 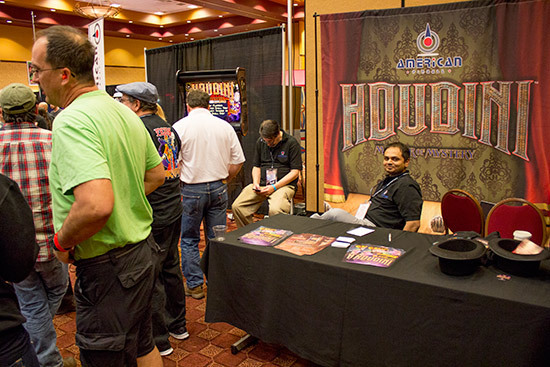 The team was here to unveil their new Houdini game which is a total redesign from the John Popaduik version of the game showed at Pinball Expo in October. 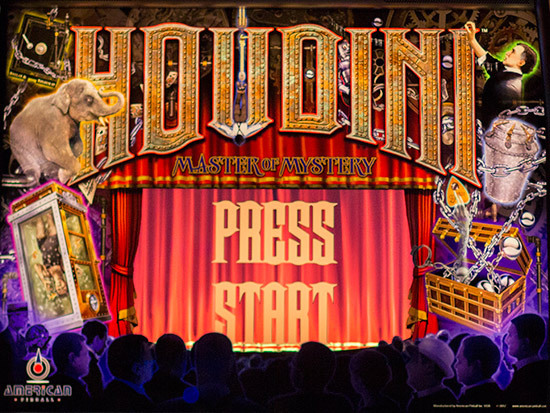 Since then, Joe Balcer has created his own game design and the title has also changed slightly from Houdini: Master Mystery to Houdini: Master of Mystery. 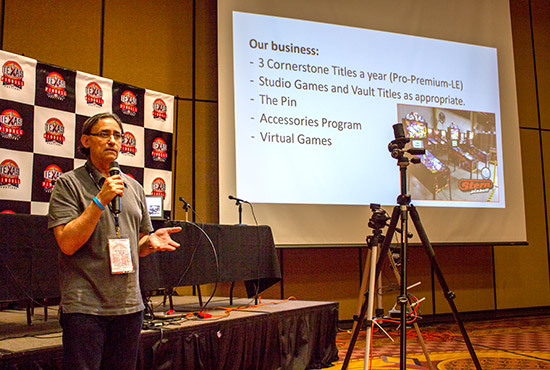 Before the reveal, Scott spoke about the company's aims and the work they have been doing so far. 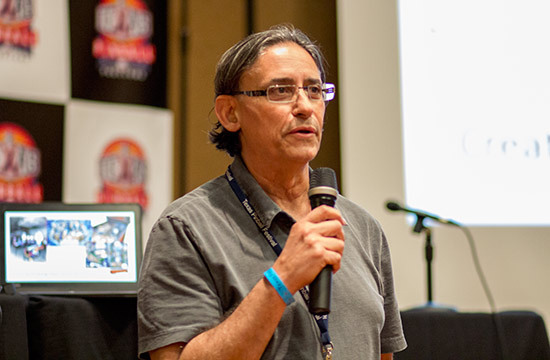 Joe then talked about his concept for the game, some of the features and how they are linked to the theme, and introduced Jeff who created the artwork and Josh who programmed it. The game is still very much a work-in-progress with many hardware, software and artwork changes expected before it goes into production. 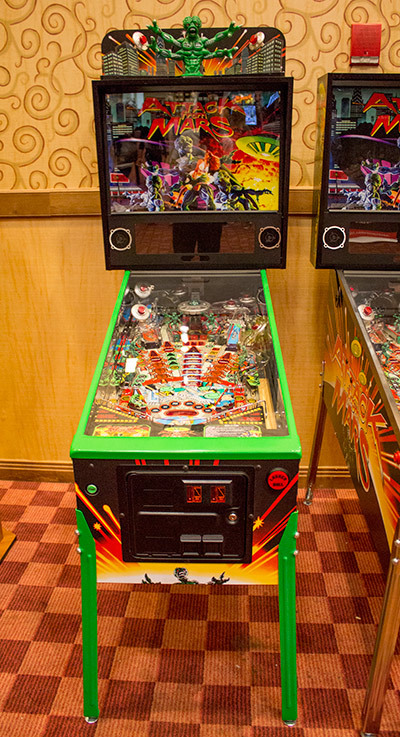 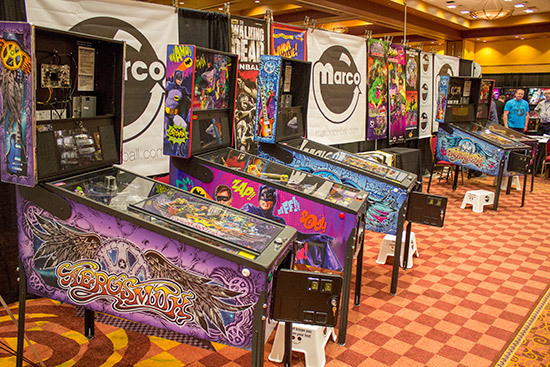 However, we do know that the game runs on a P-ROC board and this will remain in the production version, with the team saying it makes sense for a rapid start-up company like American Pinball to get off the ground with an established and capable system rather than trying to develop their own from scratch. 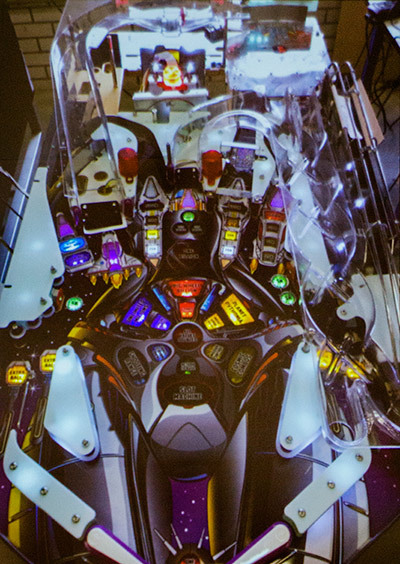 The game was then revealed. 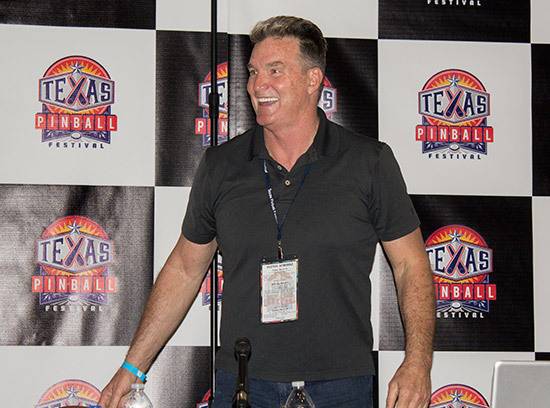 There was one final seminar on Friday, and this was with the actor who played Flash Gordon in the movie of the same name. 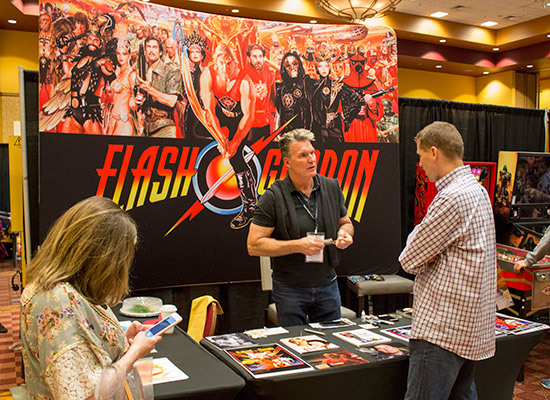 Sam spoke about his acting career including how he got the role in the Flash Gordon movie. 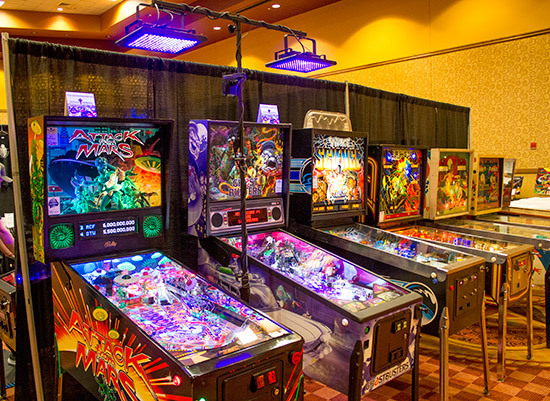 As it had been a long day and the session wasn't strictly pinball-related we didn't stay for the whole seminar. 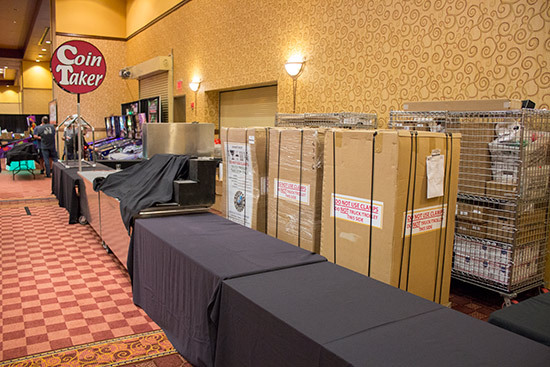 We also needed to prepare for Saturday's full day of events which began bright and early at 8am. 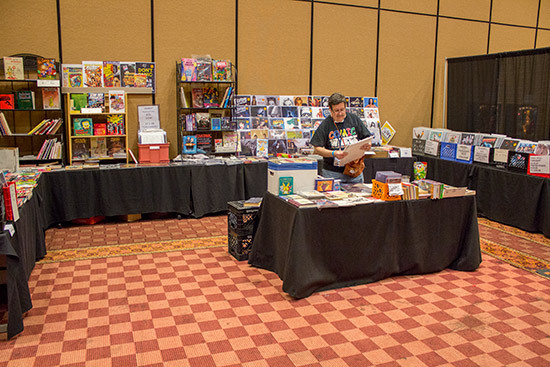 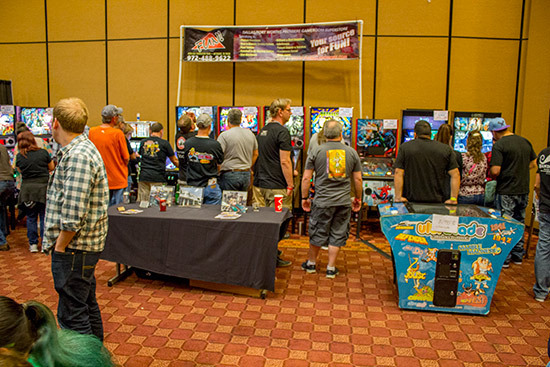 This regular part of the TPF takes place in the car park at the back of the hotel, and is the opportunity for casual sellers to offer games, parts, paperwork and other gaming-related items. 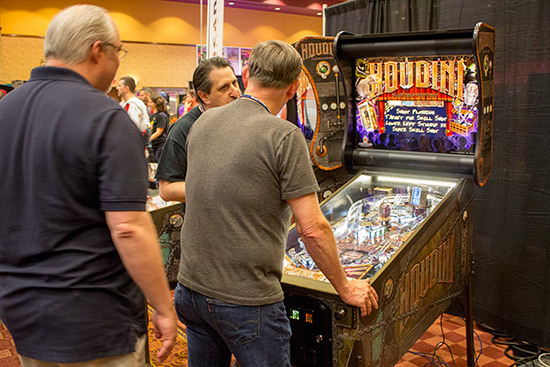 The first of the day's seminars began at 11am with Jim Schelberg's latest Pinball in the Media presentation. 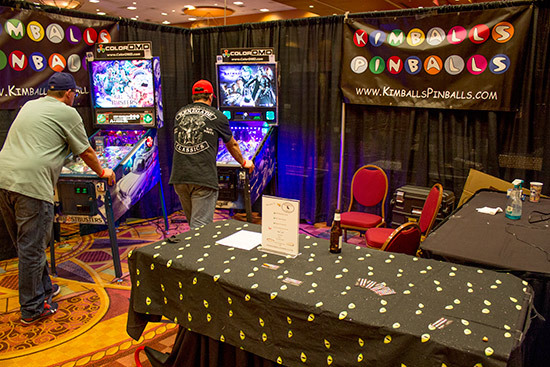 Jim showed a mix of classic and new media clips featuring pinball in one way or another, including several music videos and commercials. 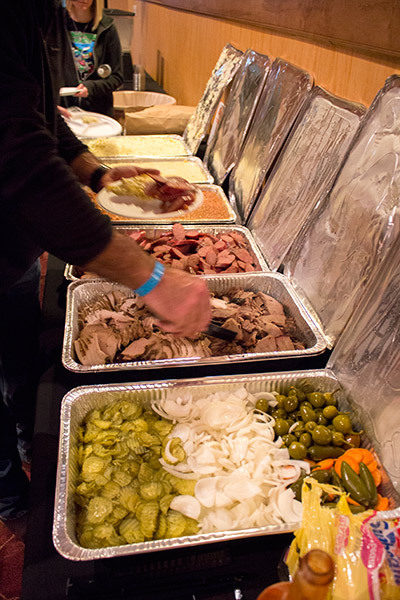 Before the seminar got under way, Gerry invited everyone to enjoy some Texan BBQ food for lunch which he generously provided for all audience members. 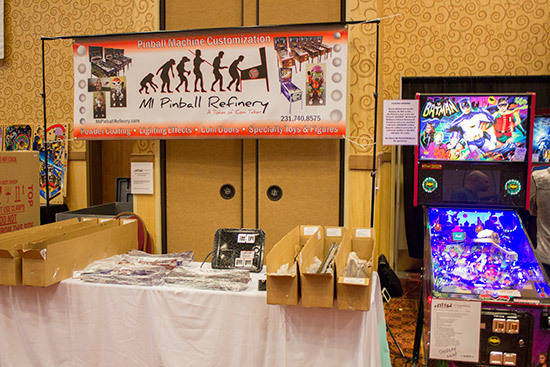 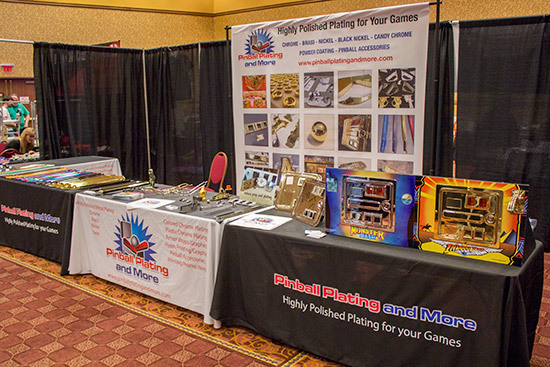 After many years detailing the development and benefits of the P3 pinball platform, this year Gerry was able to announce that the first production run of P3 machines. 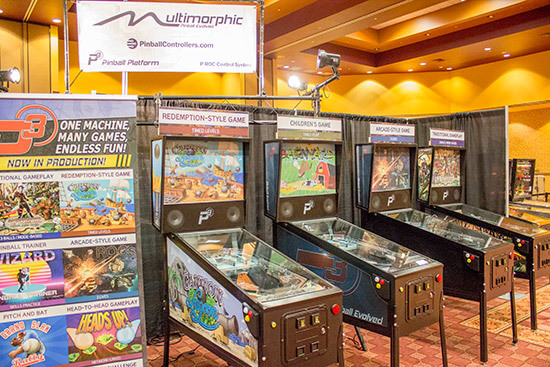 He detailed how Multimorphic is working with a contract manufacturer in the Austin area so that the first run of machines and assemblies can be built, leading to the second run, orders for which were being taken now with expected delivery in Q3 2017. 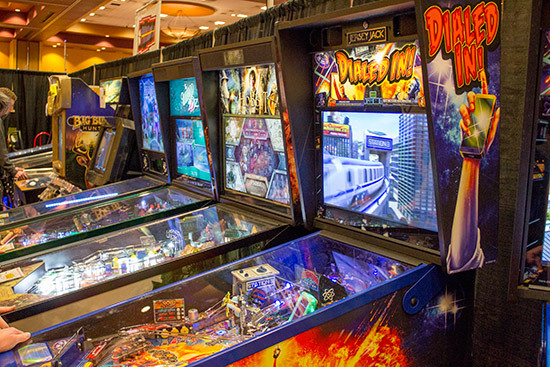 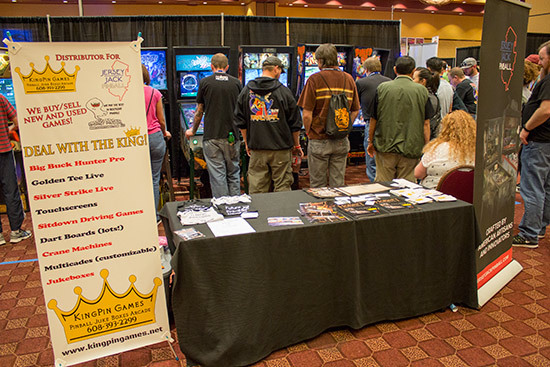 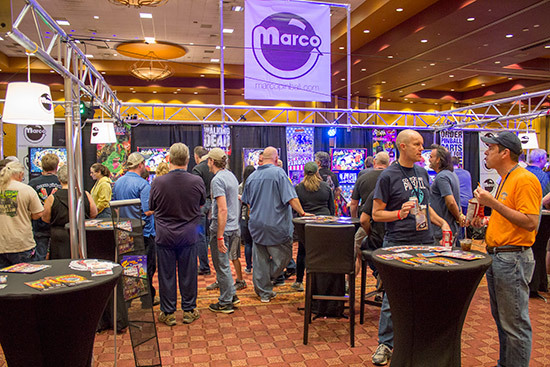 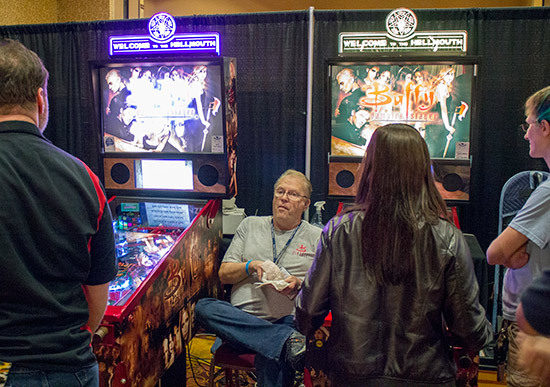 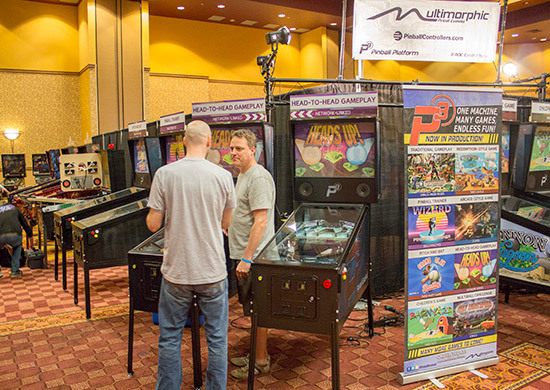 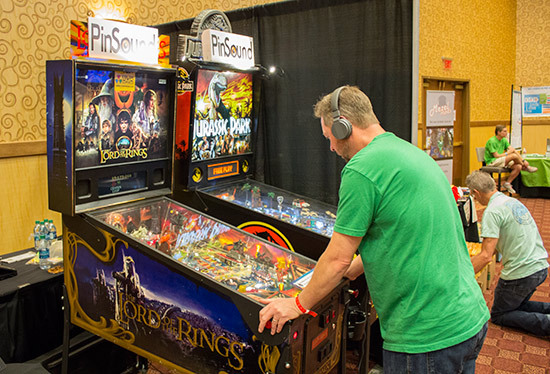 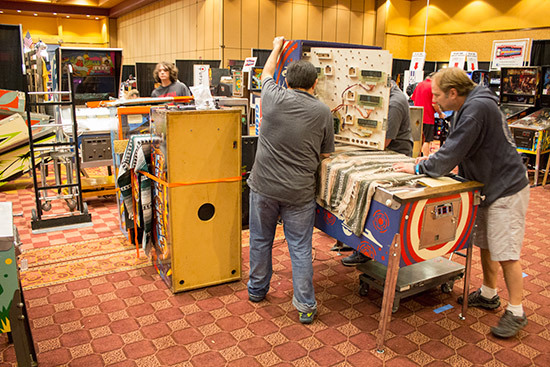 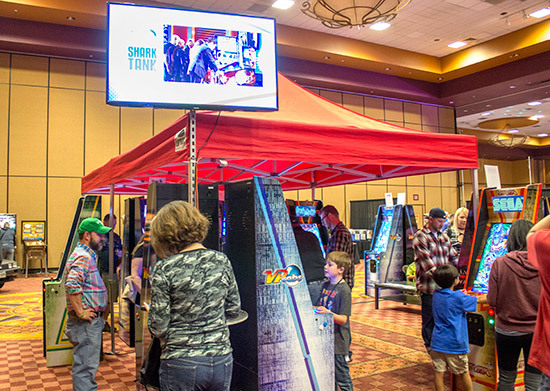 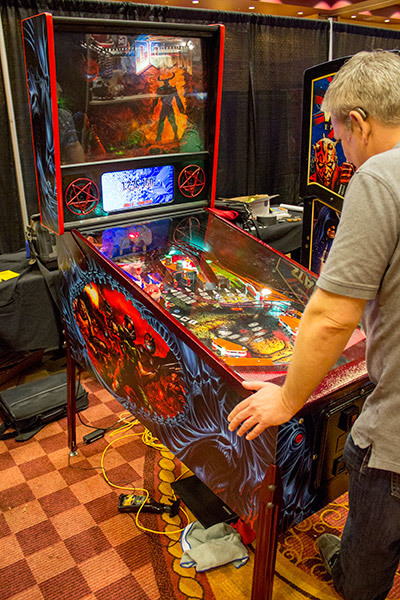 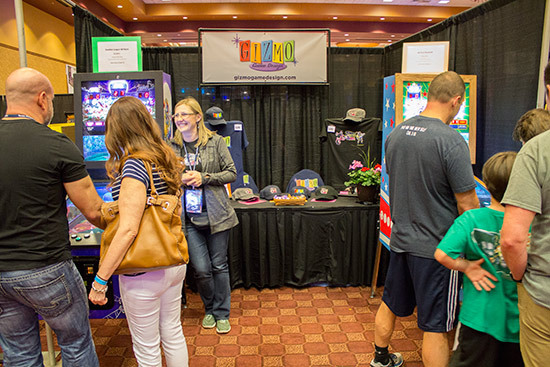 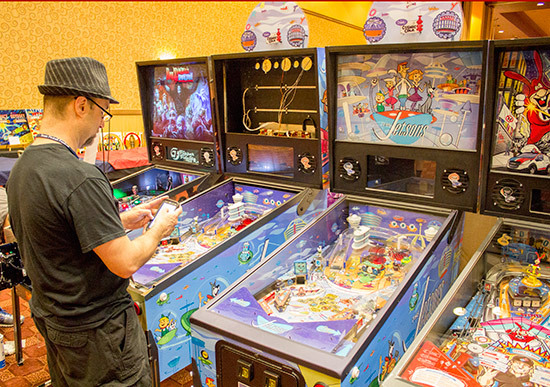 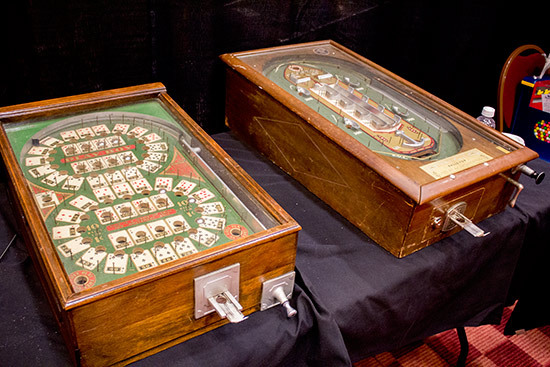 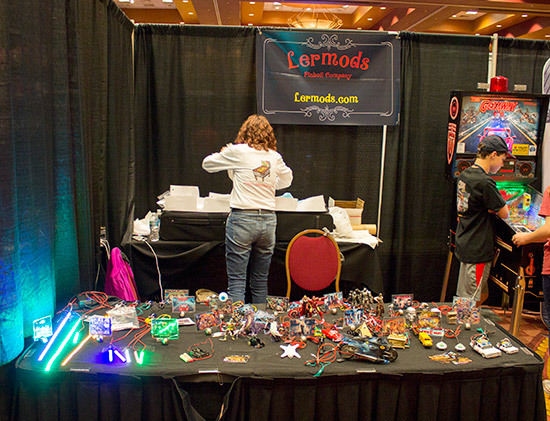 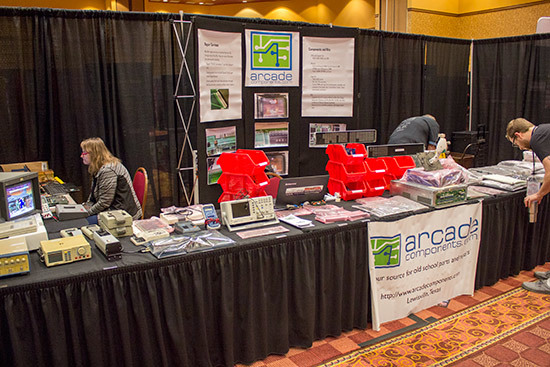 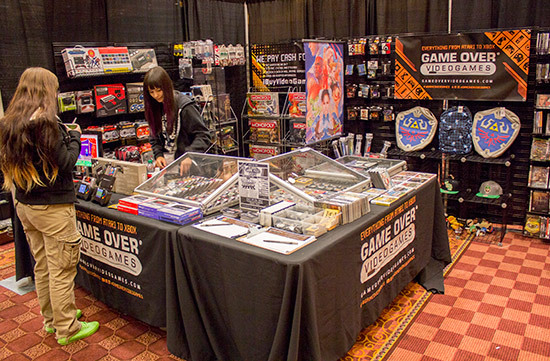 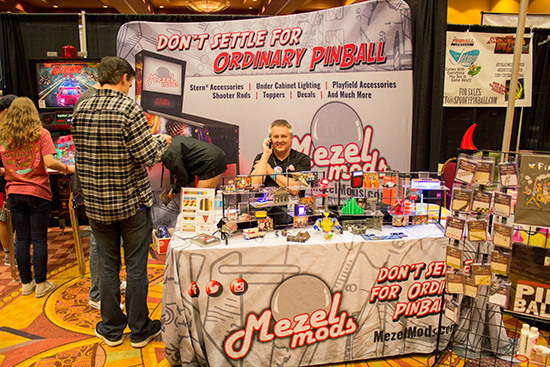 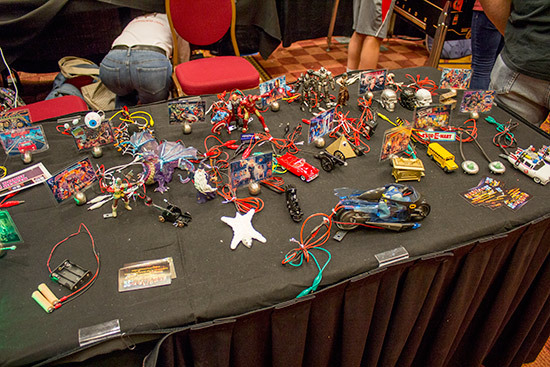 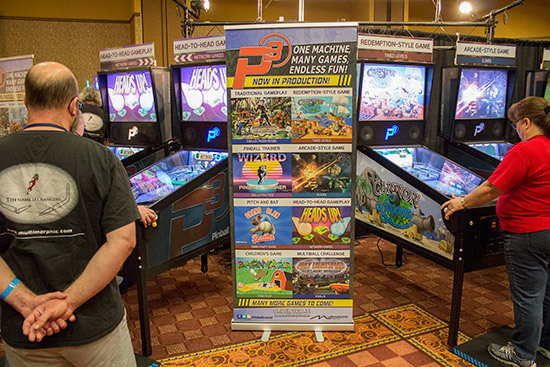 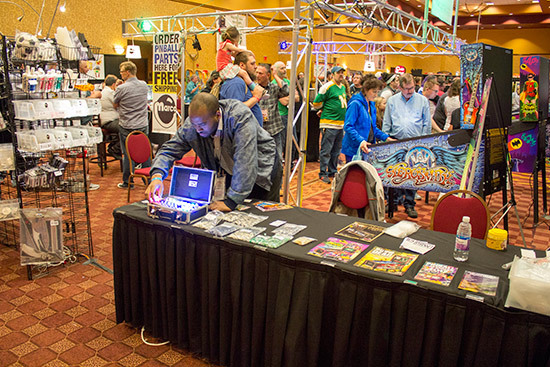 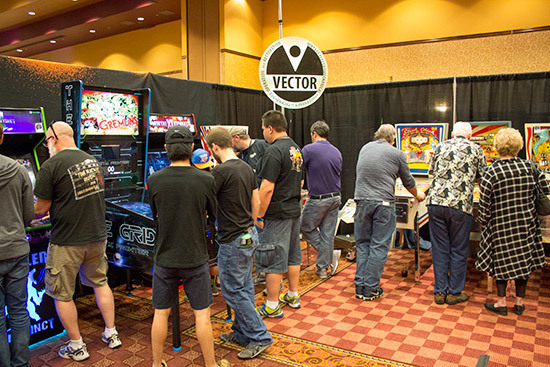 The first eight production machines were at the show set-up in various configurations to demonstrate the capabilities of the different playfield modules and games. 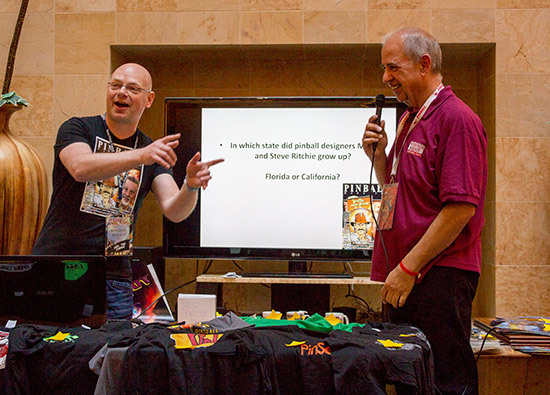 Gerry was joined on stage by Michael Ocean who uses the P-ROC and P3 to teach students to program a pinball game as well as working on some of the other P-ROC game projects out there, and BJ Wilson who talked about some of the P3 software features he has developed for Multimorphic. 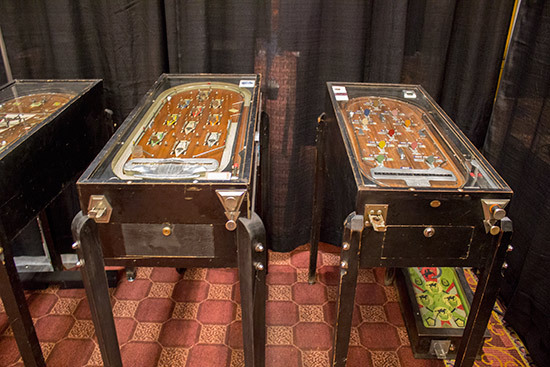 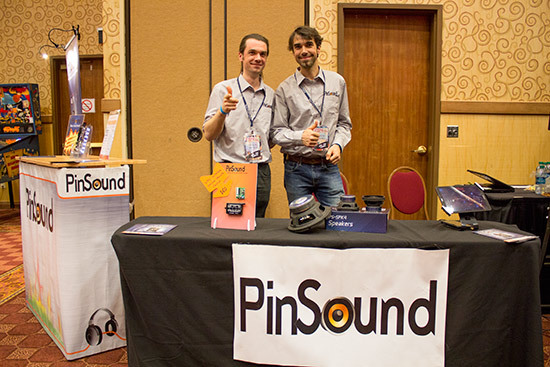 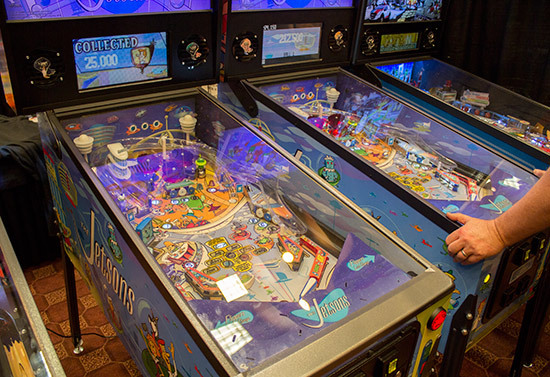 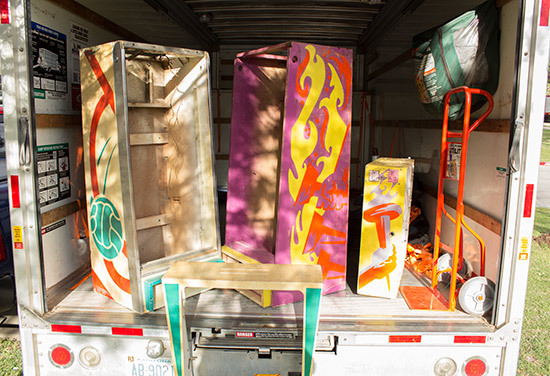 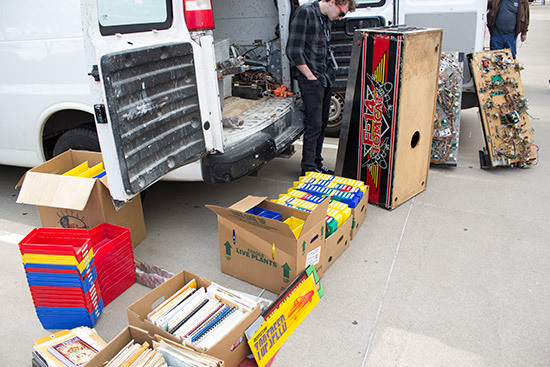 Next onto the stage were two brothers with a long history in the pinball design business. 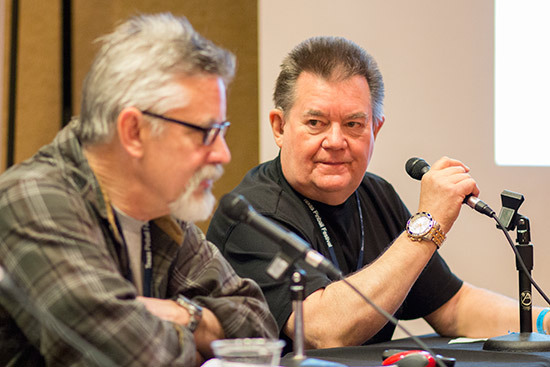 Mark and Steve spoke about their upbringings, about how their father and mother behaved and instilled in them both certain values. 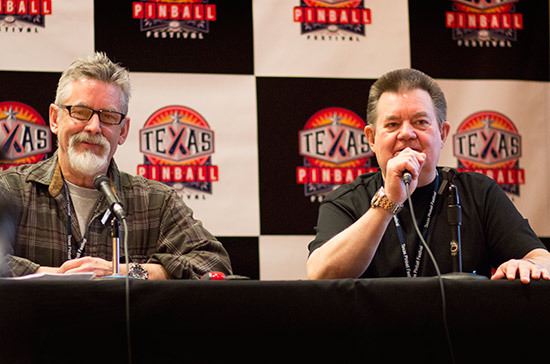 They continued by describing how they each were introduced to arcade games and pinball in particular, and then how they both became involved in the pinball business, starting at Atari in California before moving to Chicago to join Williams. 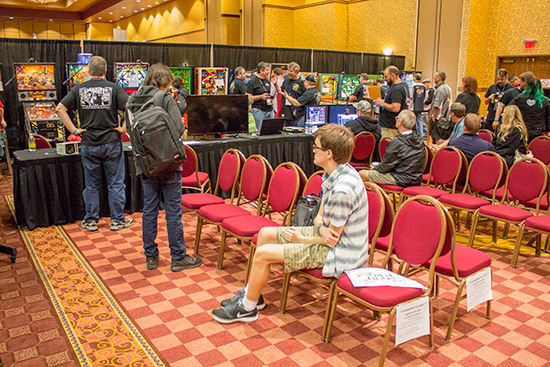 They then took questions from the audience about events from their youth as well as the background to some of their more recent game projects. 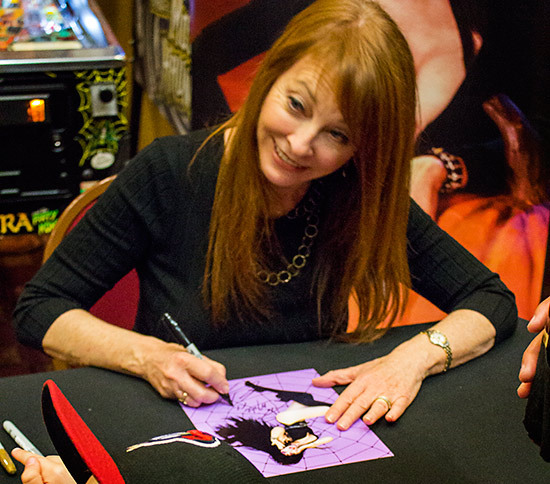 Earlier in the day Cassandra Peterson, who is perhaps better known as her alter ego Elvira: Mistress of the Dark, was at the show to meet fans and sign autographs for $20 each. 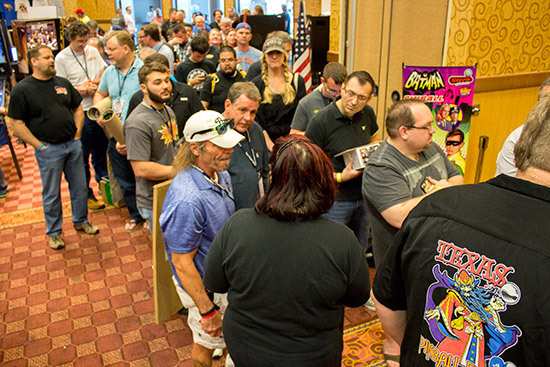 A sizeable queue built up to meet Cassandra long before she arrived in the hall. 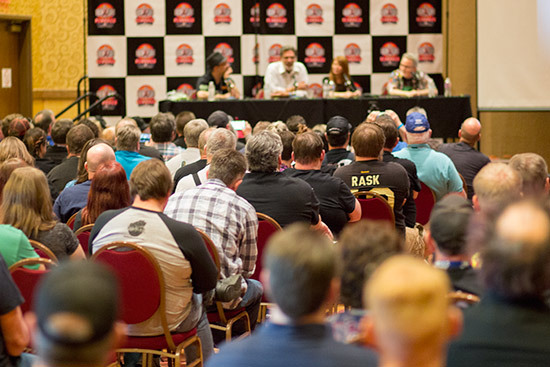 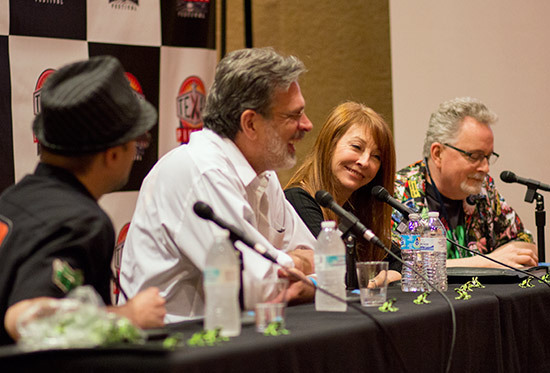 After her appearance in the show hall, Cassandra then joined Greg Freres and Dennis Nordman - the design and art team behind the two Elvira-themed games - to talk about the design processes in a panel discussion hosted by Charlie Emery. 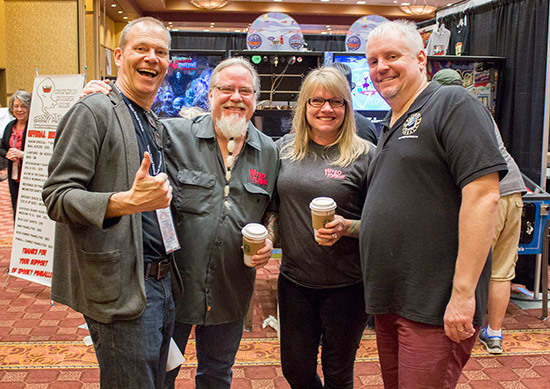 Greg and Dennis described how the idea for the first Elvira game - Elvira & The Party Monsters - came up, and how they developed the characters in the game to appear alongside Elvira. 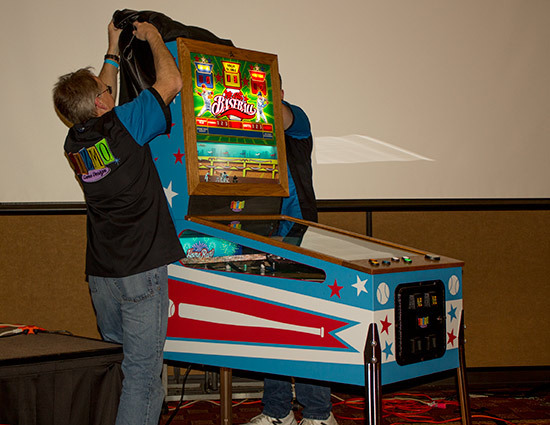 The big announcement was that Greg and Dennis's second game following Whoa Nellie! 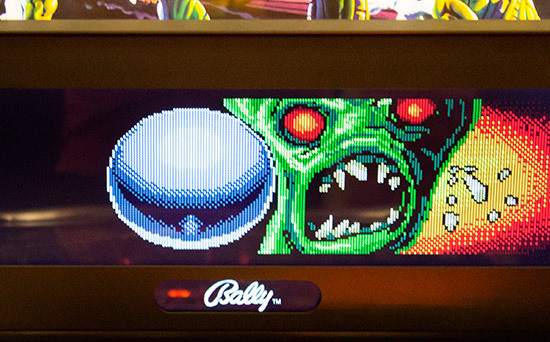 would be their as-yet-unnamed third Elvira-themed game, following on from Elvira & the Party Monsters and Scared Stiff. 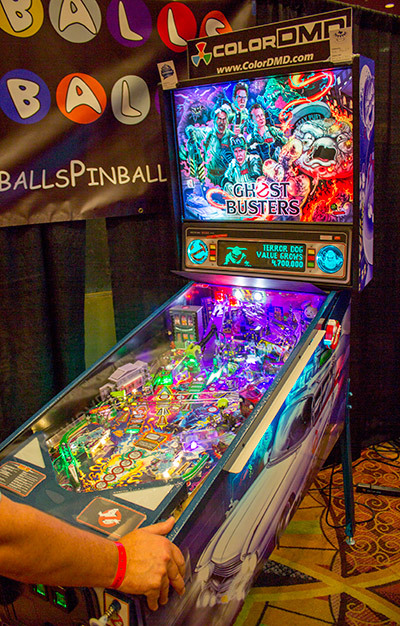 No date for the game was announced, but it is expected to be built by Stern Pinball as one of their 'studio' titles. 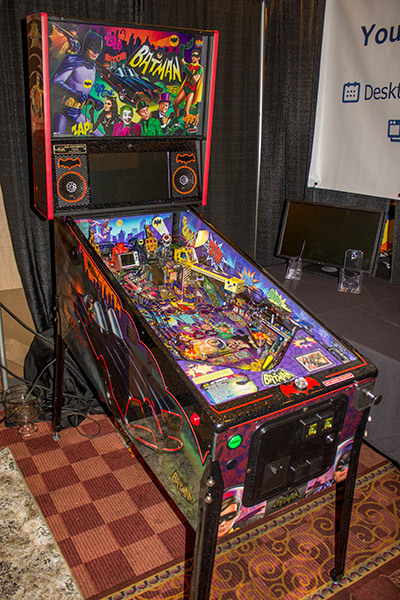 Next onto the stage at Frisco was Jaap Nauta from Dutch Pinball. 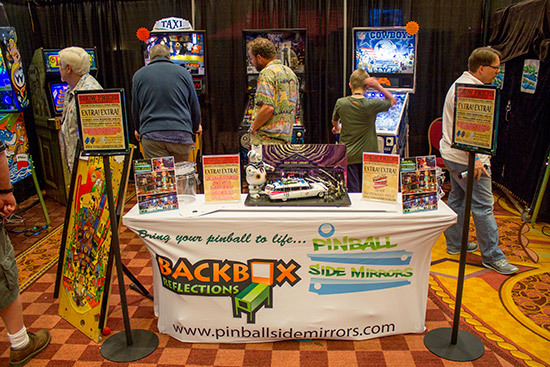 There was a lot of news, rumour and speculation surrounding Dutch Pinball's The Big Lebowski game, and Jaap was here to tell the story of what has happened to the both the game and the company. 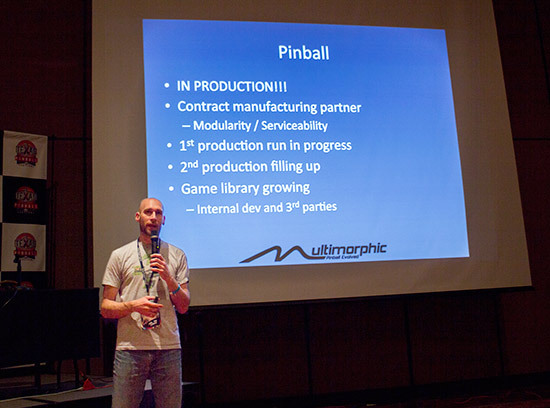 Jaap related the history of the game, the agreements Dutch Pinball has with ARA to build the game, and how those agreements were broken when the price was increased by €1,000 and the agreement to build the remaining games as well as a number of Dutch Pinball's second game was not kept. 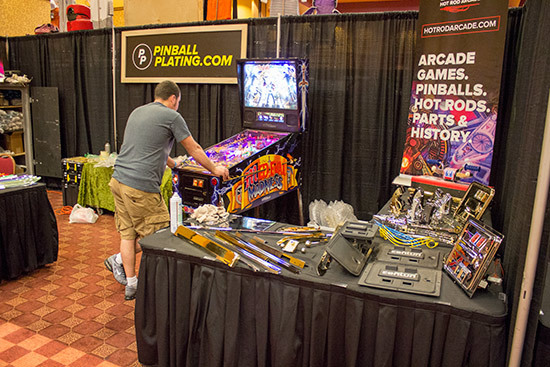 He said eventually Dutch Pinball had enough and couldn't give in to ARA's demands, which put them in a stalemate situation where ARA had around 40 completed games in their factory but wouldn't release them until the new, higher price per game was paid. 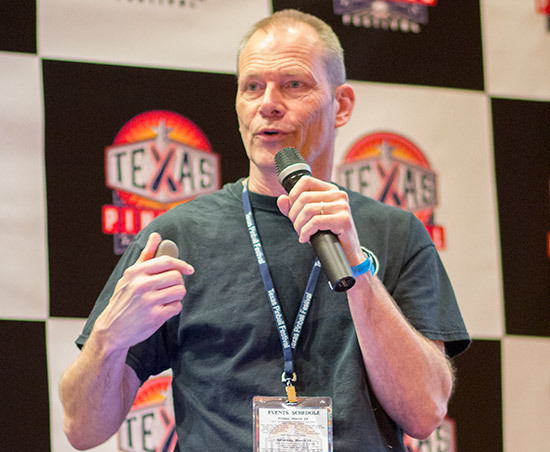 Jaap explained the Dutch legal process and said their intended way forward was to build their second title with a new contract manufacturer in the Netherlands called VDL, sell it, and raise enough operating capital to continue production of The Big Lebowski at VDL. 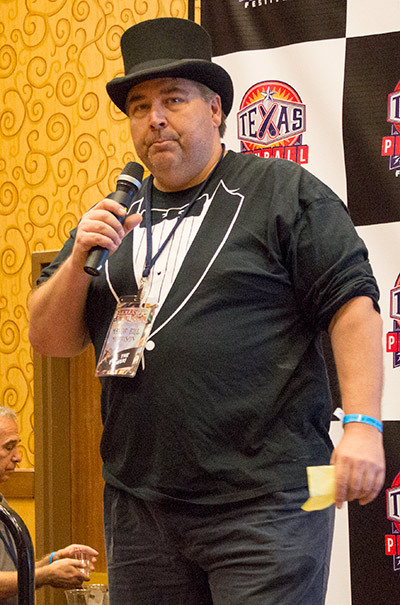 Or maybe ARA would see reason and come to a deal. 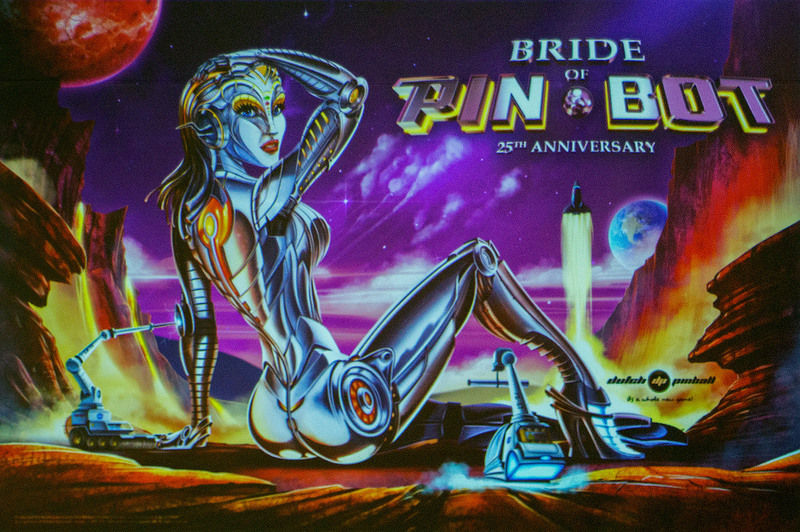 That second title hadn't been announced until the TPF, but now it was revealed as Bride of Pinbot 25th Anniversary. This takes the Bride of Pinbot 2.0 ruleset and builds upon it to produce a complete game with a new cabinet and remade playfield incorporating the 2.0 modifications. 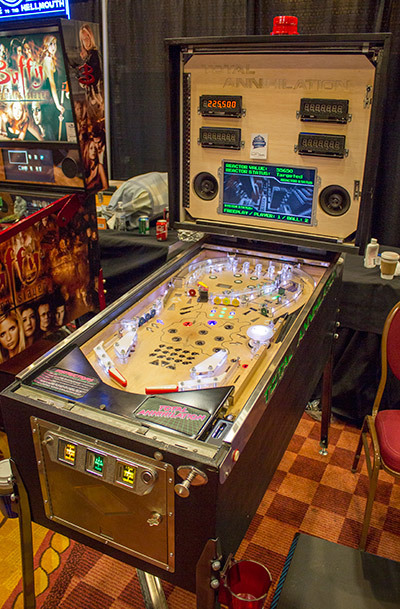 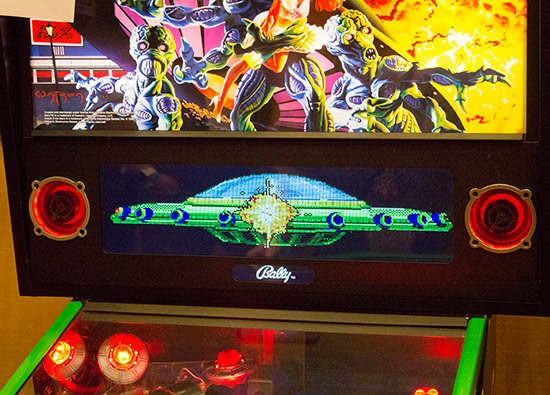 The playfield design is the same as the original Bride of Pinbot, but with updated inserts, display, lighting and sound. 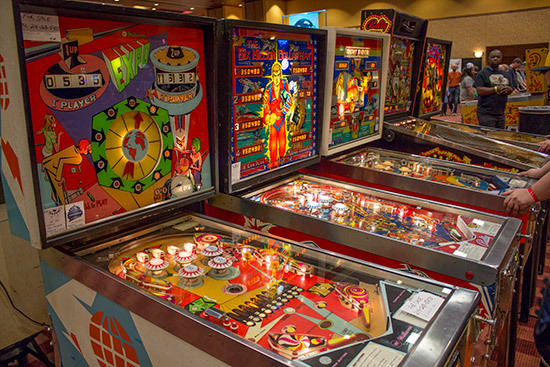 They plan to make up to 150 Super Limited Editions by the end of 2017, followed by a run of standard games and - hopefully - the remaining The Big Lebowski games. 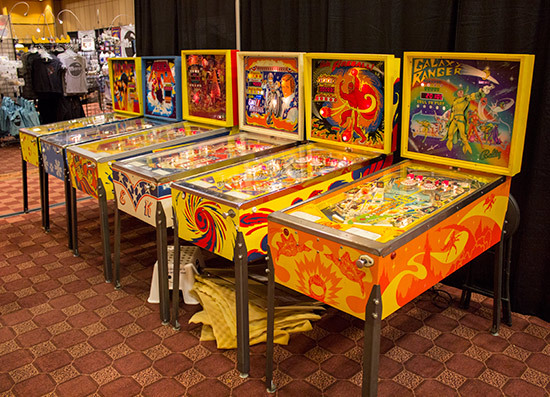 The Super LE's would have 100 machines sent to North America and split between DP distributors CoinTaker and Nitro Pinball. 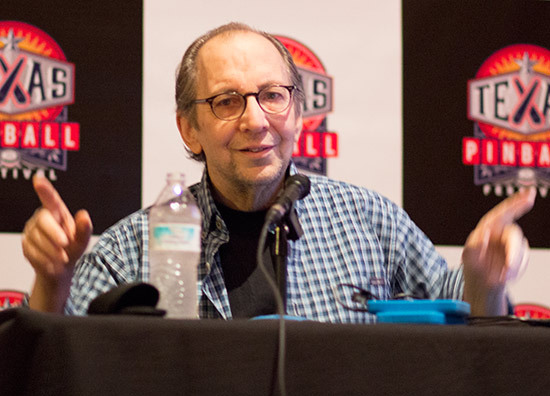 The remaining 50 would go to the rest of the world. 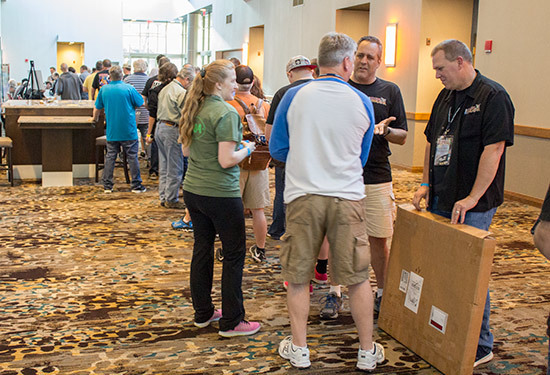 The first batch of 25 is scheduled for June 1017. 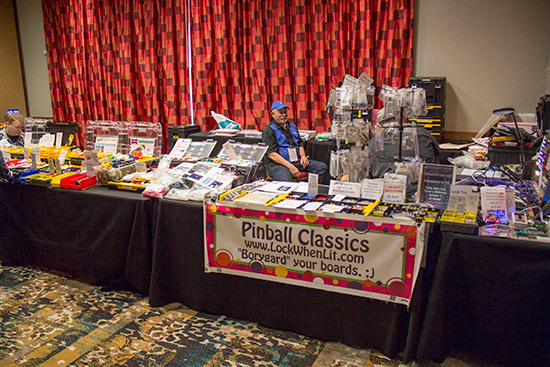 The next speaker was Andrew Heighway of Heighway Pinball. 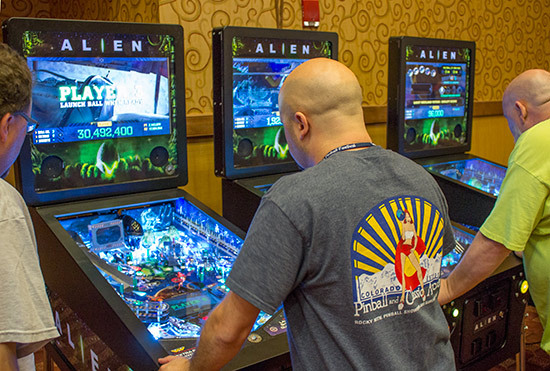 Andrew was back at the TPF to bring the latest news from the Heighway Pinball factory in south Wales and update us on progress on the company's Alien Pinball title. 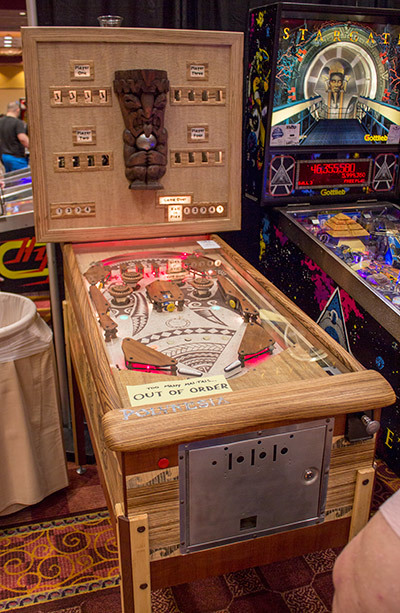 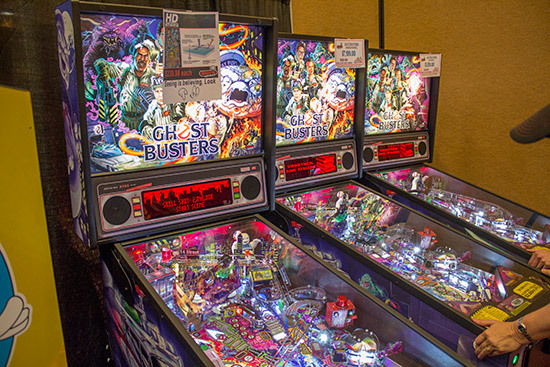 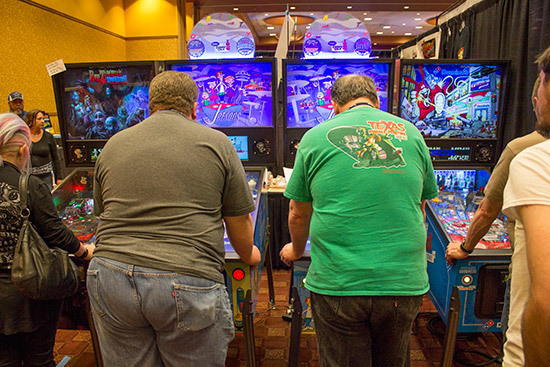 Three Alien Pinball machines were in the show hall for guests to play. 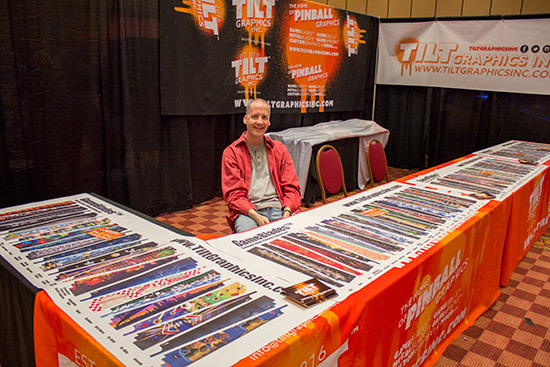 Andrew talked about the new facilities at the company's factory in Ebbw Vale and their production schedule for both Alien and Full Throttle. 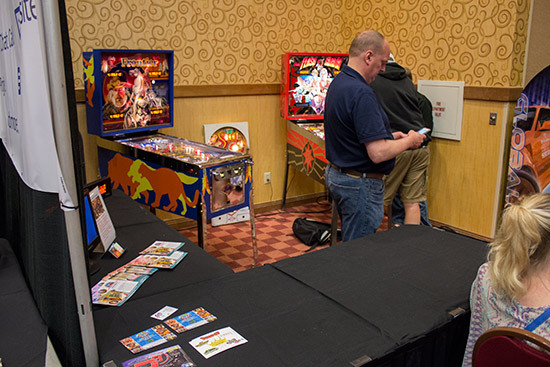 You can see Andrew show us around the Heighway Pinball factory in our exclusive Pinball News video shot right before the Texas show. 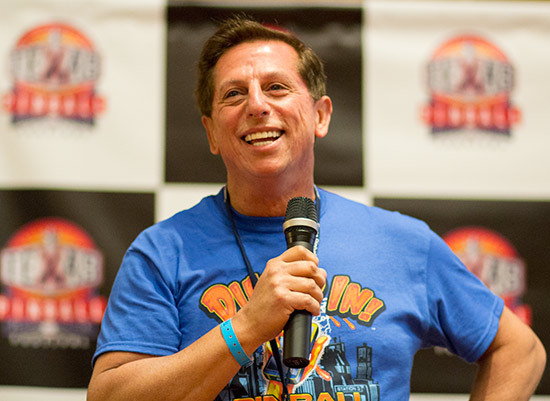 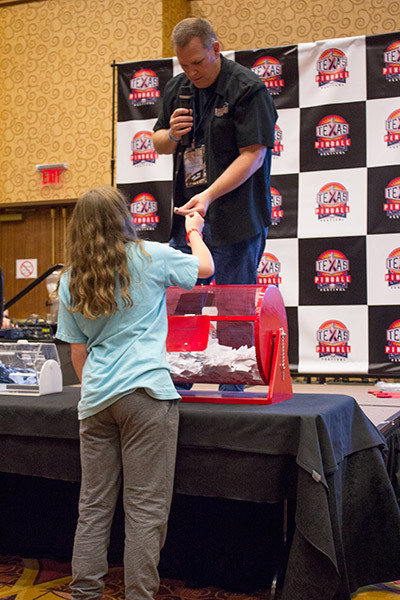 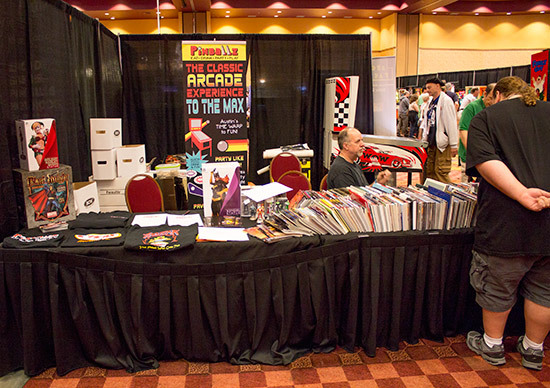 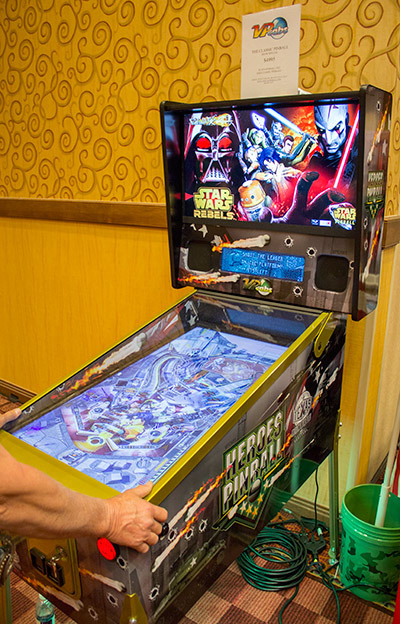 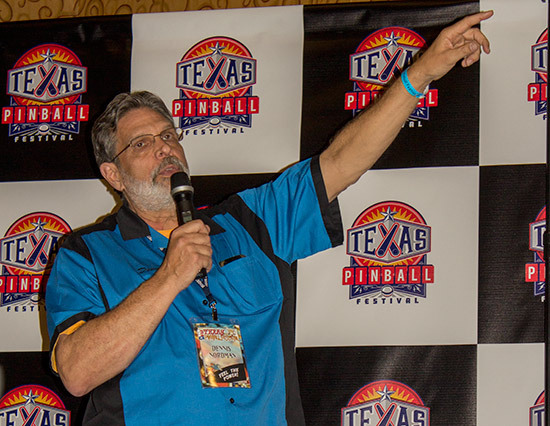 The next speaker at this year's TPF was Jack Guarnieri of Jersey Jack Pinball. 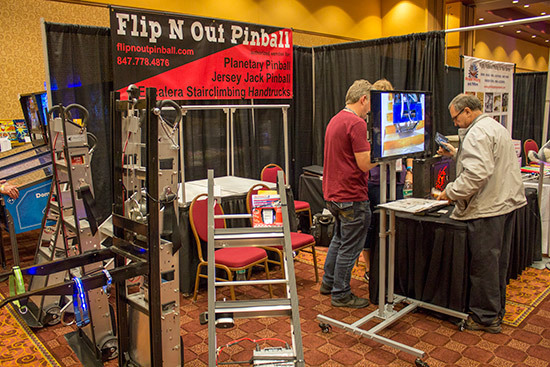 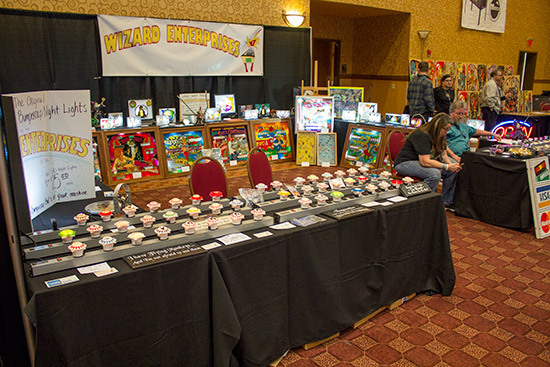 Jack updated the seminar audience on the latest happenings at the Jersey Jack Pinball factory, including production details of The Wizard of Oz, The Hobbit, and shorty, Dialed In!. 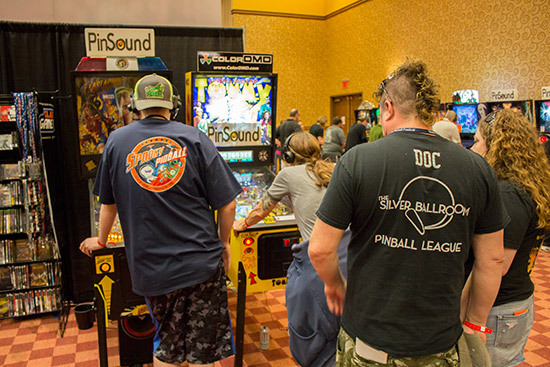 Regarding Dialed In!, Jack told how he and game designer Pat Lawlor met and agreed to collaborate on creating the company's third title. 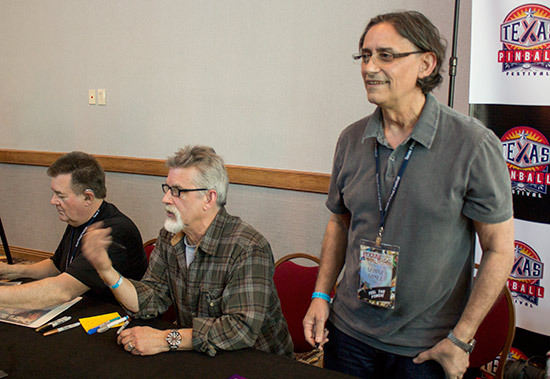 Jack was joined on stage by Eric Meunier and Butch Peel from JJP who spoke about the technical aspects of the game, including the lighting system and the upcoming manual for The Hobbit. 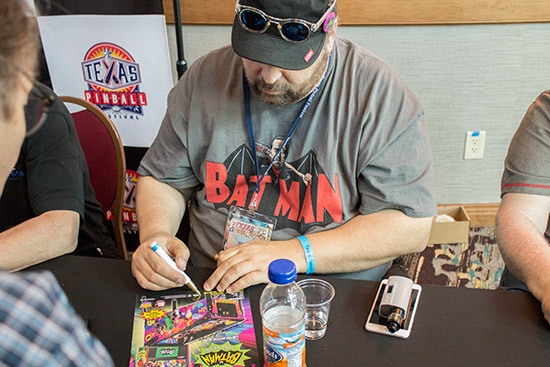 After Jack's seminar there was an autograph session on a table outside the seminar hall. 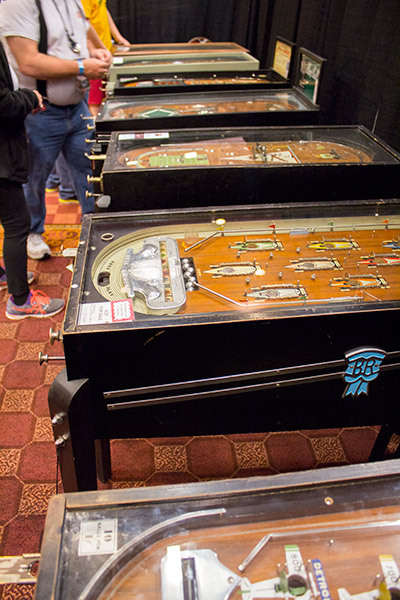 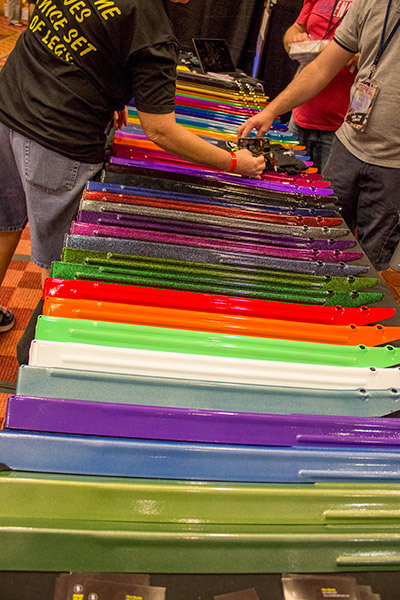 People queued with items to be signed - such as translites, backglasses, playfields and flyers - or simply to meet the pinball celebrities and talk about their work. 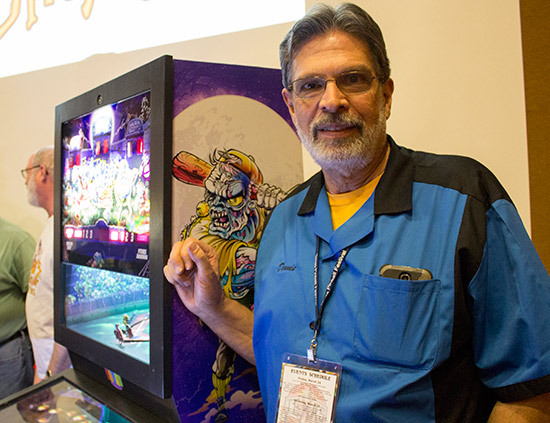 Once the signing session was over, George Gomez took to the stage in the seminar room for his talk about the happenings at Stern Pinball. 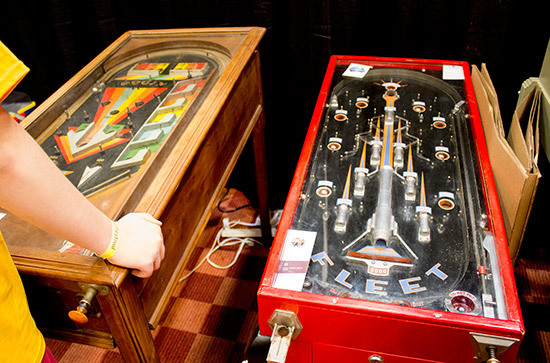 George told the audience about the games Stern Pinball currently has in production, and the different types of games the company produces which he separated into 'Cornerstone' titles - regular in-house designs - Studio Games brought to the company by external designers, Vault Titles remade from previous title when demand is seen, The Pin home models, Contract Games made for, and marketed by other companies, Virtual Games such as the Stern Pinball Arcade with Farsight, and their accessories business selling mods, clothing, collectibles and the like. 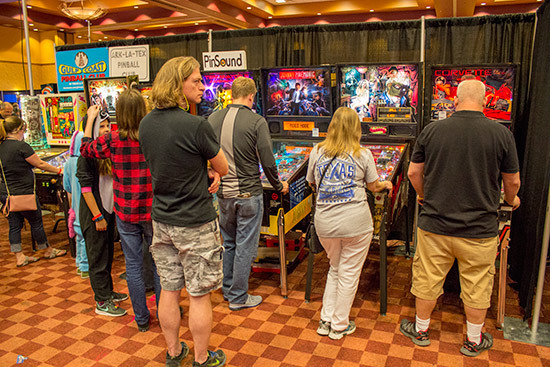 After George there was a break from the seminar format with the world premier of a new pinball documentary. 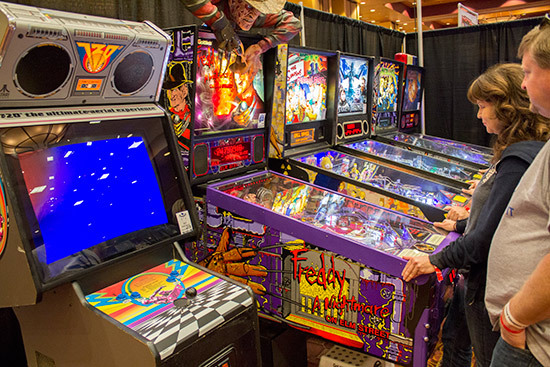 The full-length documentary details the creation and business expansion of Spooky Pinball in Benton, Wisconsin, USA through interviews with the team involved in starting and running the business, as well as those creating the games. 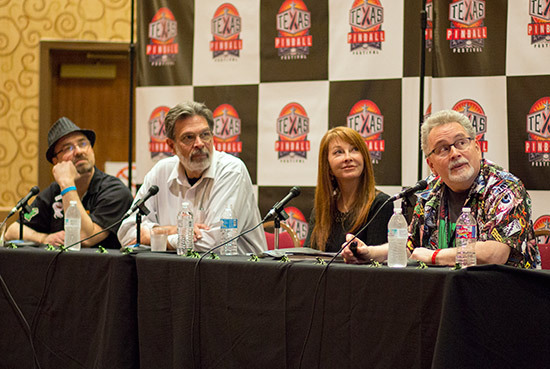 The film was made by Joel and Dana Reeves and they were here to talk about its creation, from concept to shooting and editing. 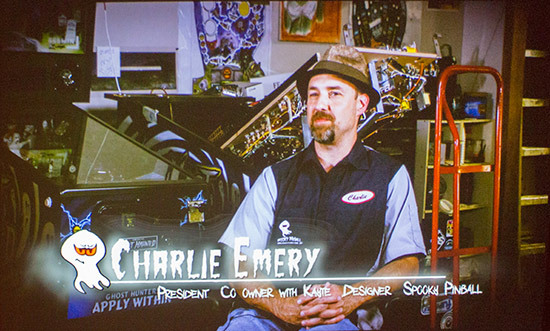 After the documentary screening, there was a panel discussion with members of the Spooky team where the company's next title was revealed as Alice Cooper's Nightmare Castle. 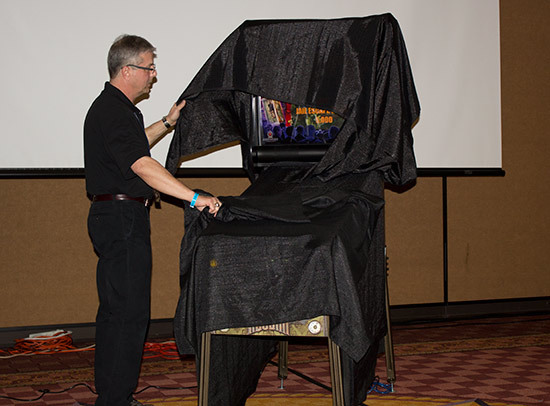 A teaser video has also been produced. 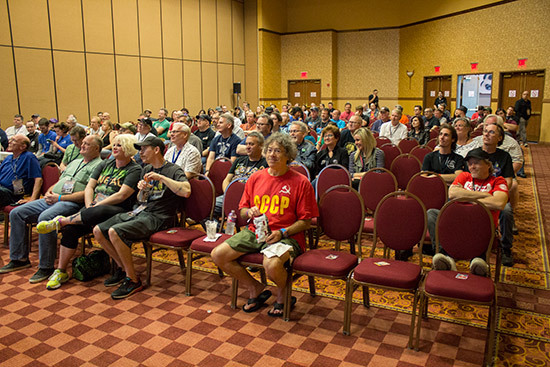 For those otherwise engaged on Saturday evening, the documentary was repeated in the seminar hall at 10am on Sunday morning. 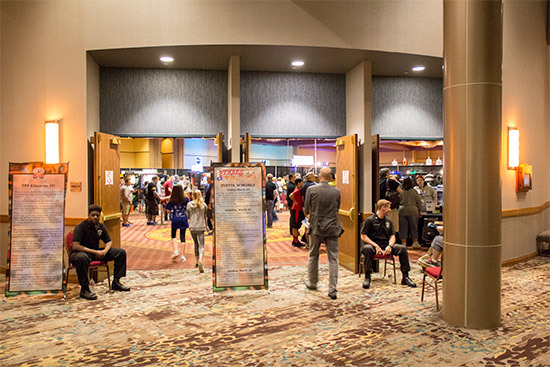 Let's return to the main show hall and see how the TPF looked on Saturday evening. 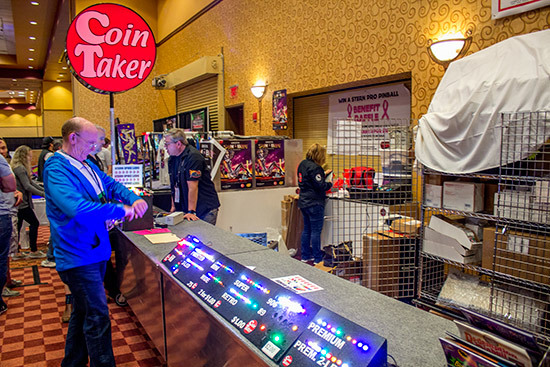 Here's our exclusive Thirty Minute Tour video of the show hall which was shot on Sunday morning. 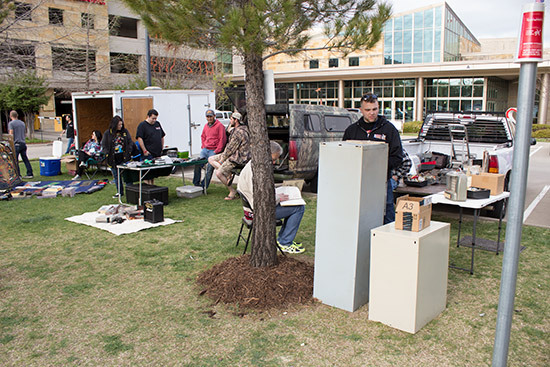 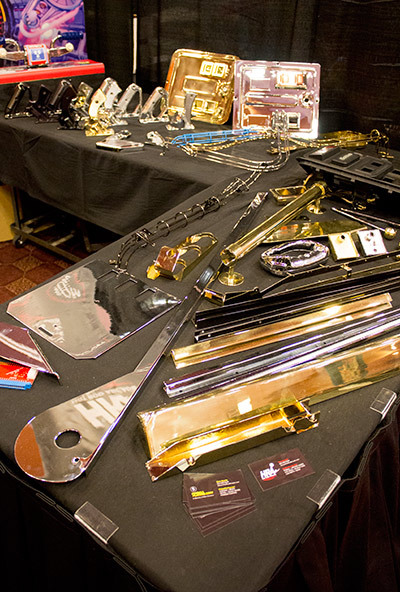 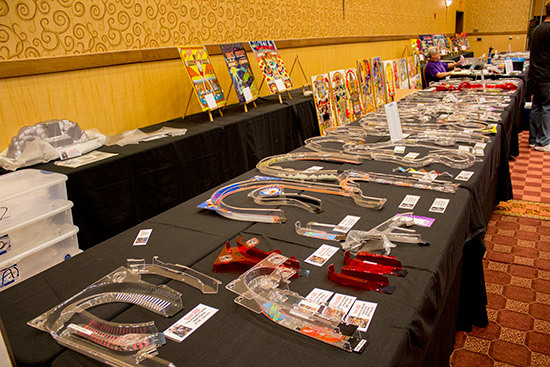 At the end of the show on Sunday afternoon, there were numerous presentations for the Best-in-Show awards in various categories at a ceremony hosted by Ed Vanderveen and Bill Morrison. 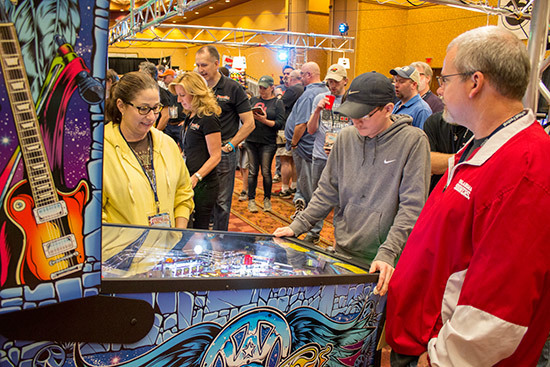 The show finished with draws for cash prizes for those who brought machines, and the grand Pinball for Patriots prize draw for a virtual pinball from VP Cabs. 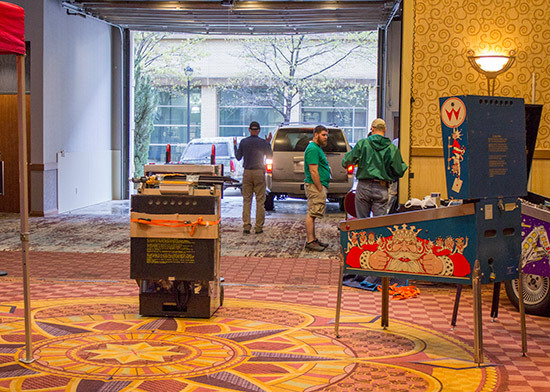 The show then wrapped up and the breakdown of machines and stands could begin. 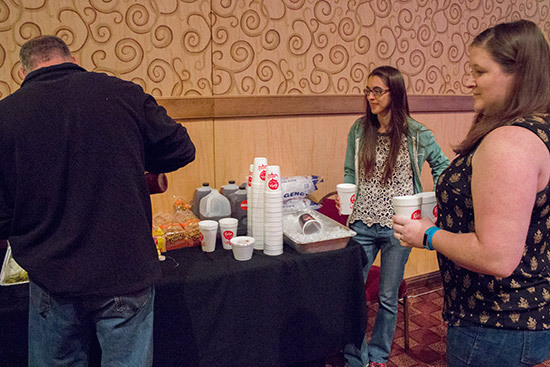 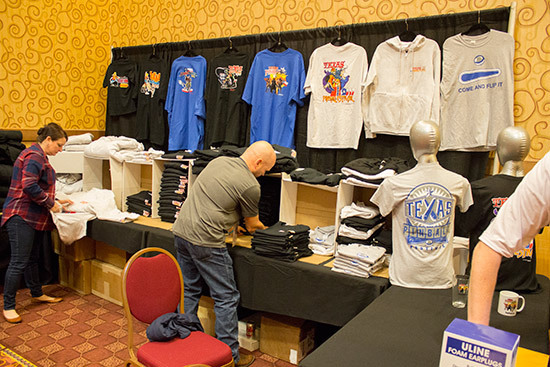 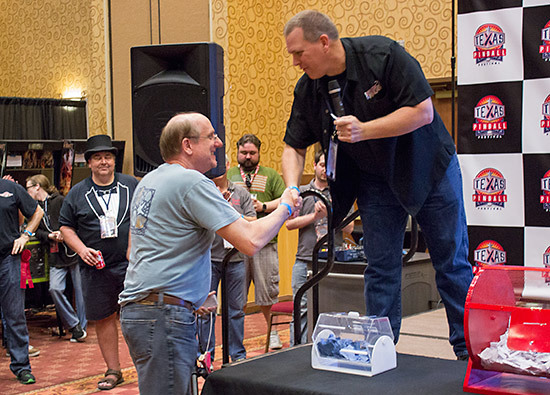 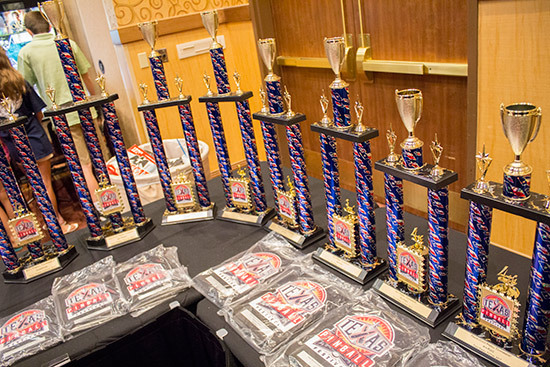 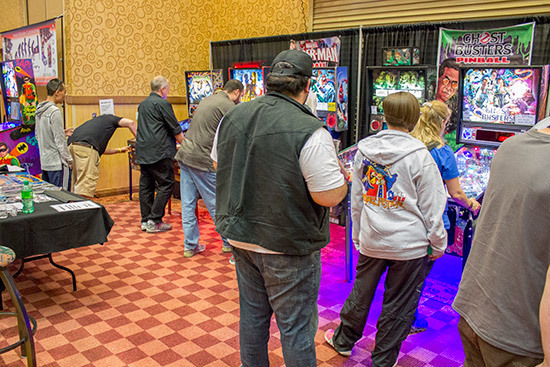 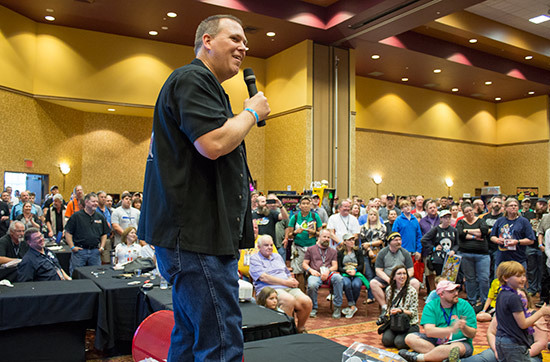 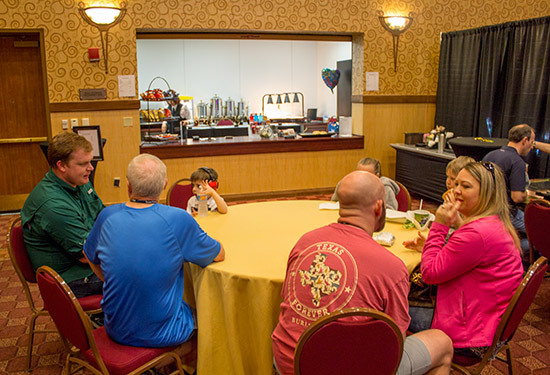 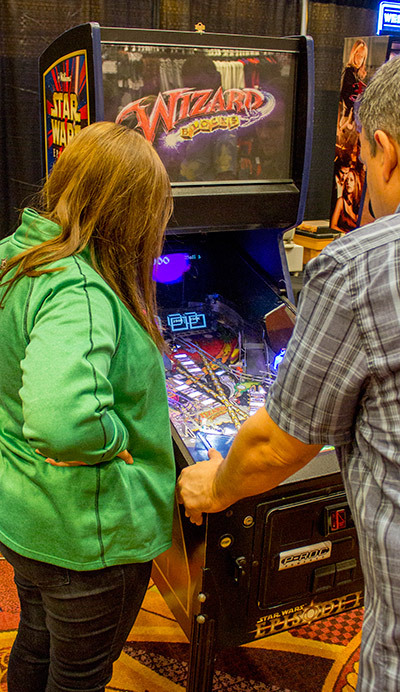 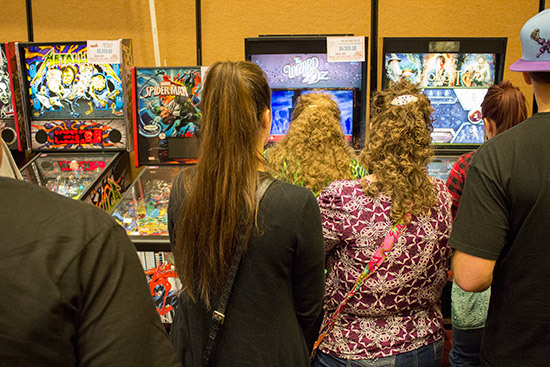 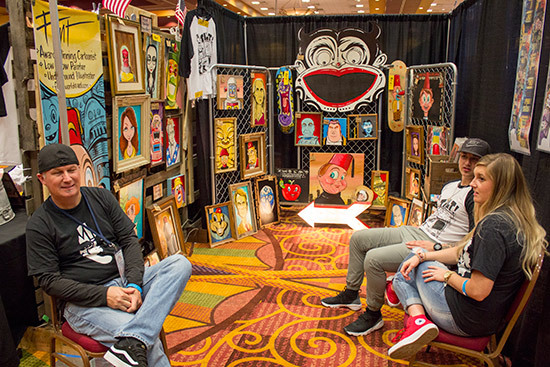 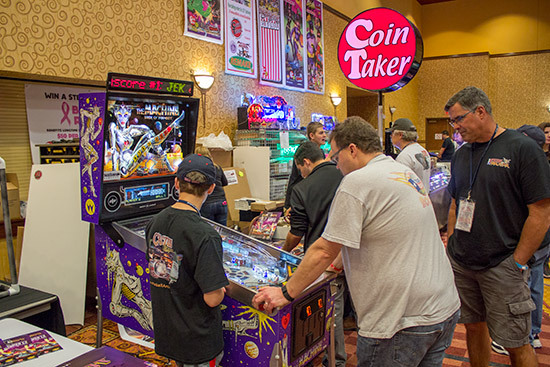 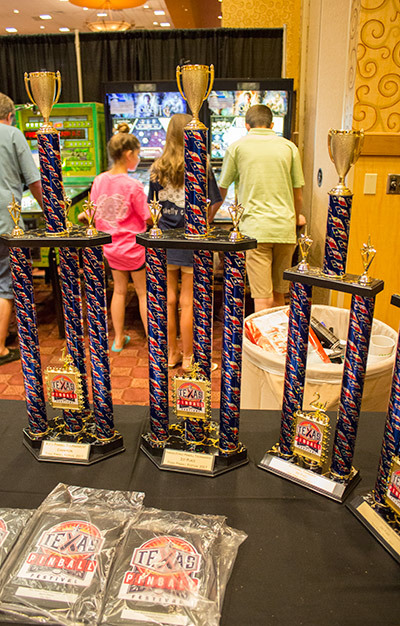 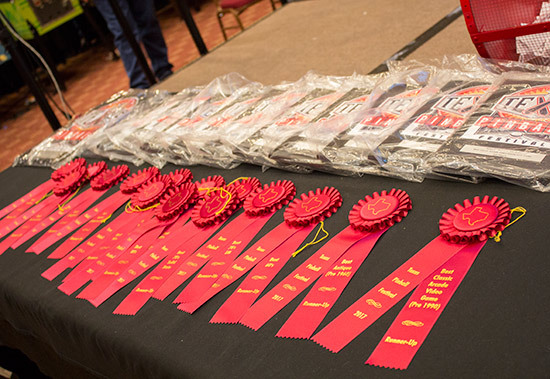 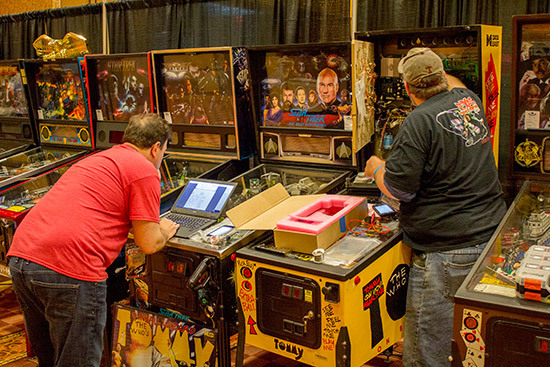 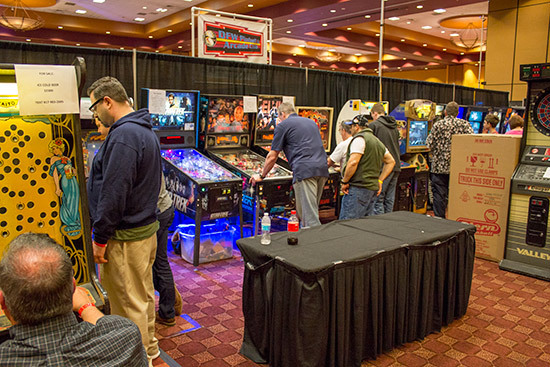 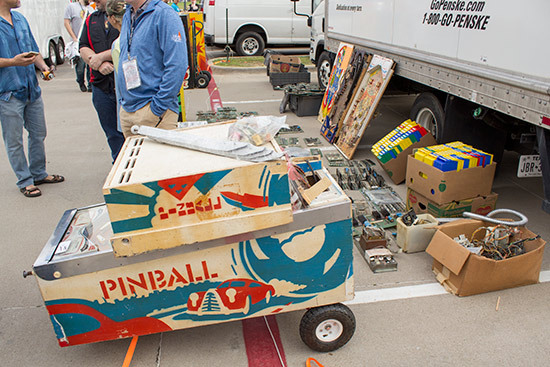 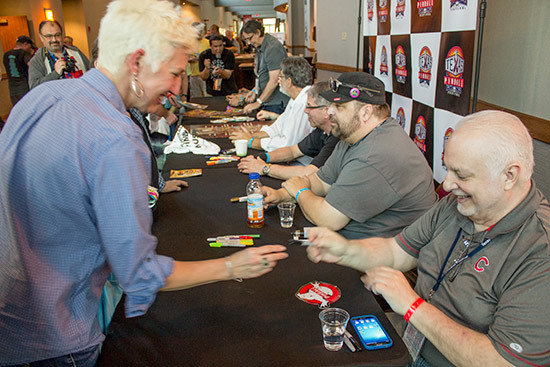 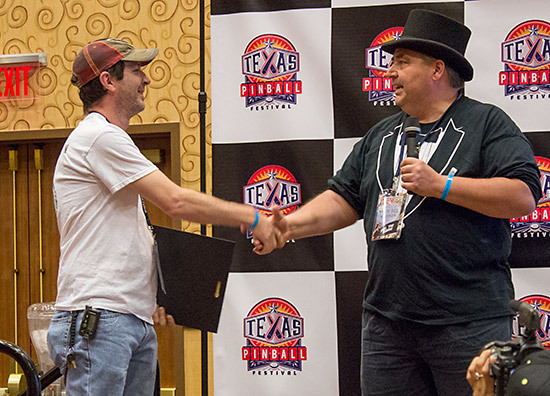 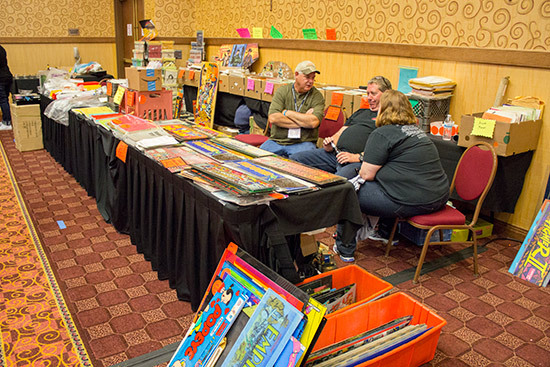 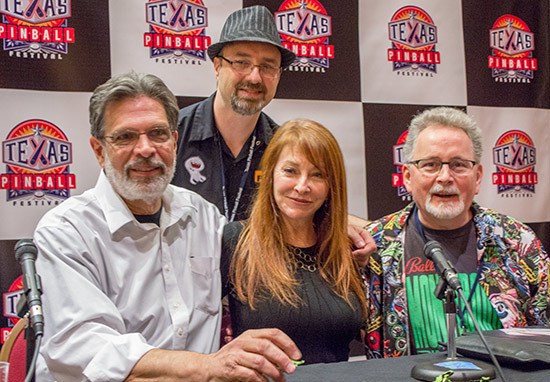 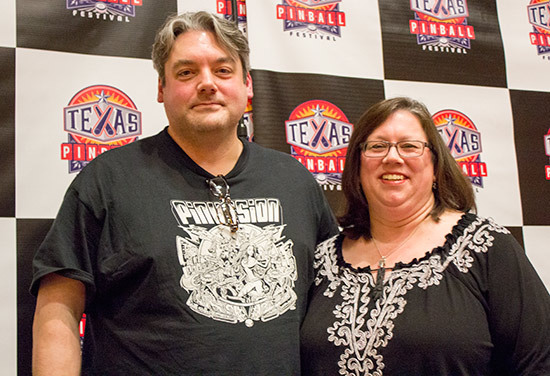 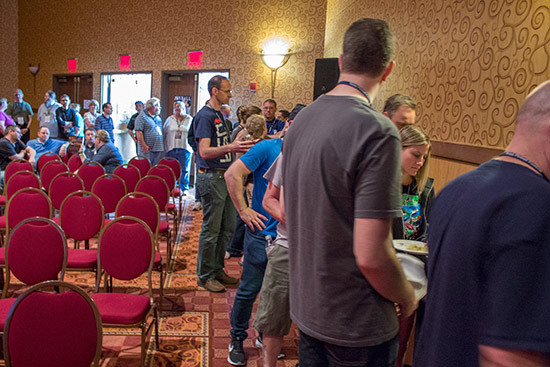 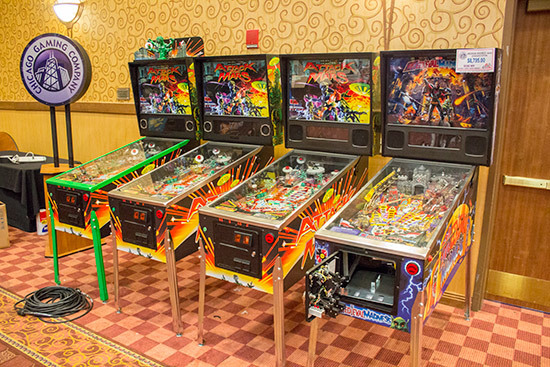 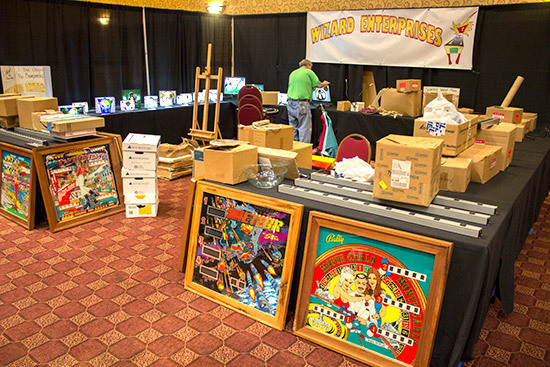 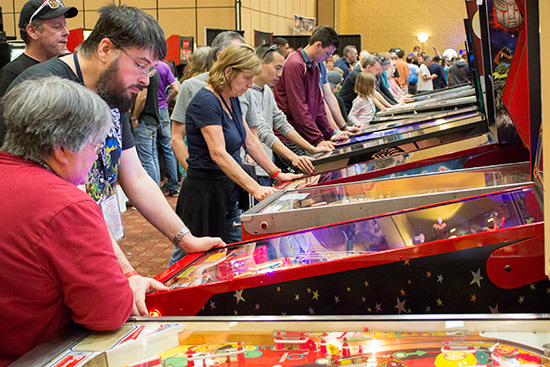 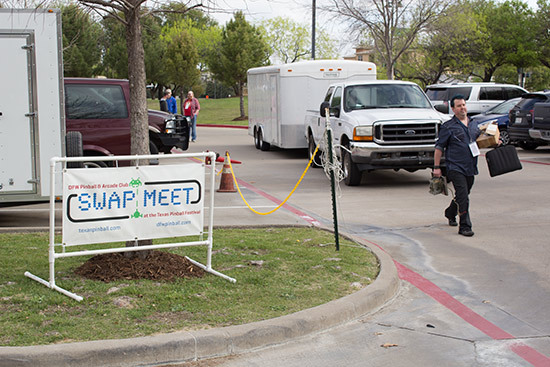 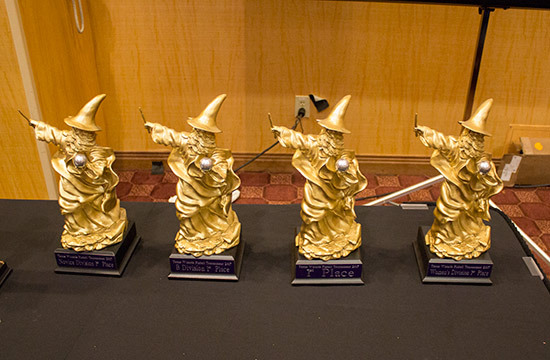 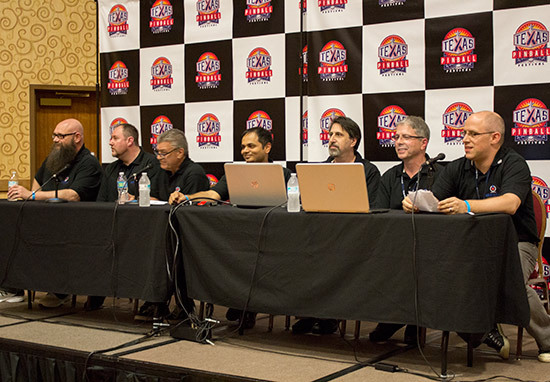 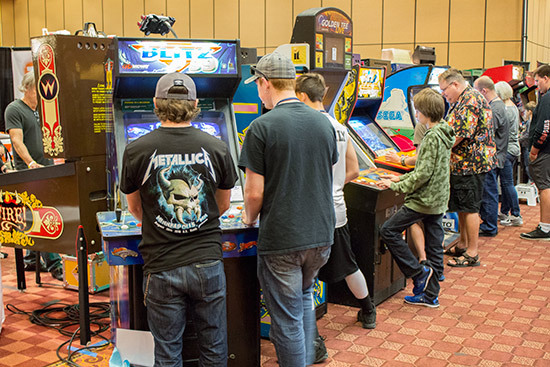 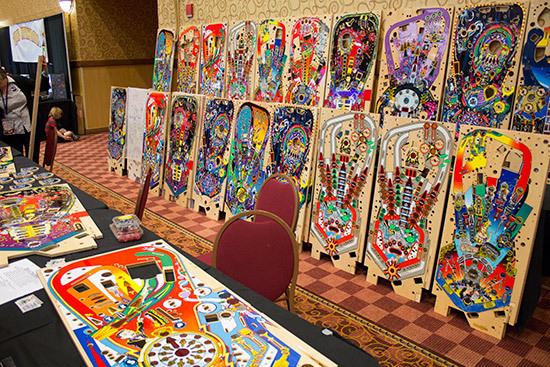 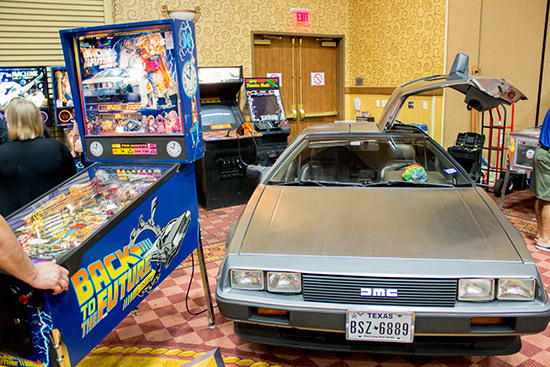 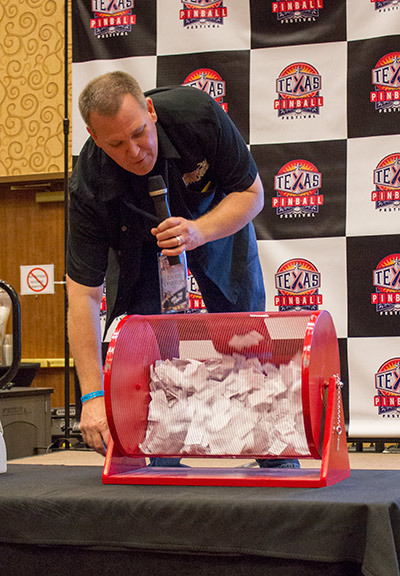 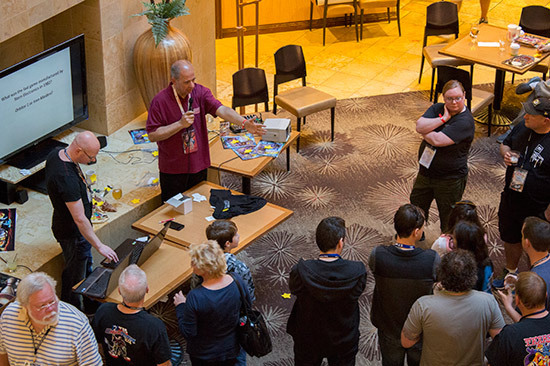 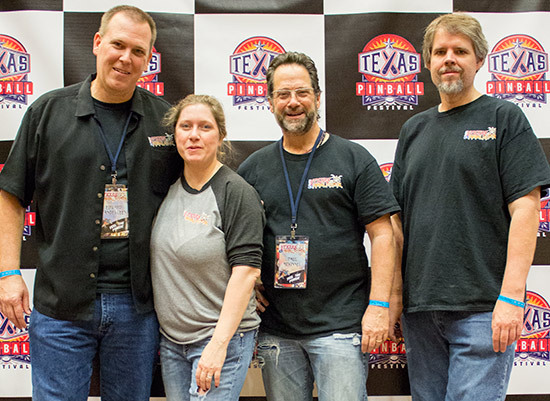 We'll be back with to complete this report with the results of the tournaments and our closing thoughts, but until then we'll just thank the Texas Pinball Festival organisers Ed, Kim, Paul and Ken for their help and hospitality.